Writer's note: To those who celebrate: Happy Hanukkah! 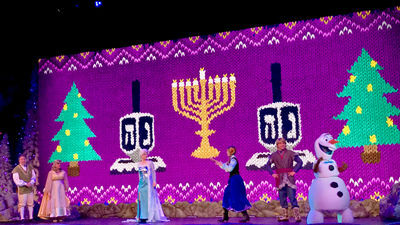 Unfortunately, other than the stage area for Mostly Kosher at the Epcot International Festival of the Holidays, there really is not much decor to show off for Hanukkah around Walt Disney World Resort. So, as we fry up some latkes and try not to eat too much chocolate gelt, in this week's Views around the World we will continue our tour of the Christmas displays at the resorts we started last week, as well as see the Walt Disney World Ambassador Team's special tribute to Walt Disney's 115th birthday at Disney's Hollywood Studios on December 5, and even enjoy some highlights of Disney Vacation Club's Moonlight Magic event at Epcot last night (December 11). 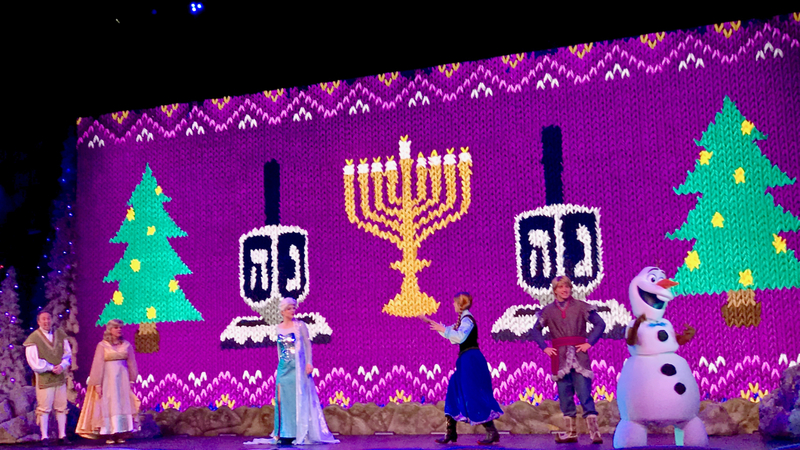 At Disney's Hollywood Studios, "For the First Time in Forever: A Frozen Sing-Along Celebration" includes Olaf's nod to Hanukkah. Photo by Alan S. Dalinka. Before we get to the Views, we have News. 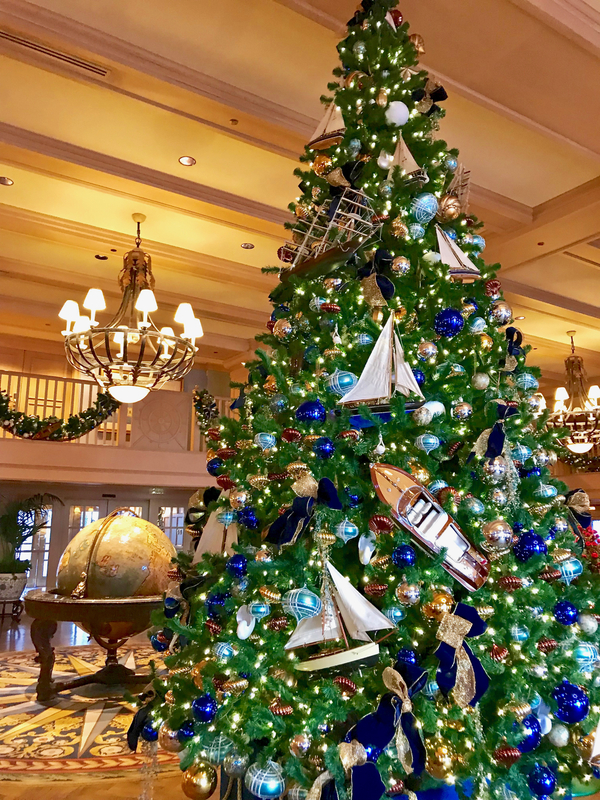 As you may recall, last week, Disney Parks Blog teased its first ever "12 Days of Disney Parks Christmas" featuring daily "new details about events, entertainment, attractions and more" at Walt Disney World, as well as Disneyland, Disney Cruise Line, and Aulani, a Disney Resort & Spa in Ko Olina, Hawaii (where I really enjoyed my visit as a DVC Member this past spring I really do still intend to write about soon). I started a Twitter Moment to track the daily posts in one place and you can visit at any time. 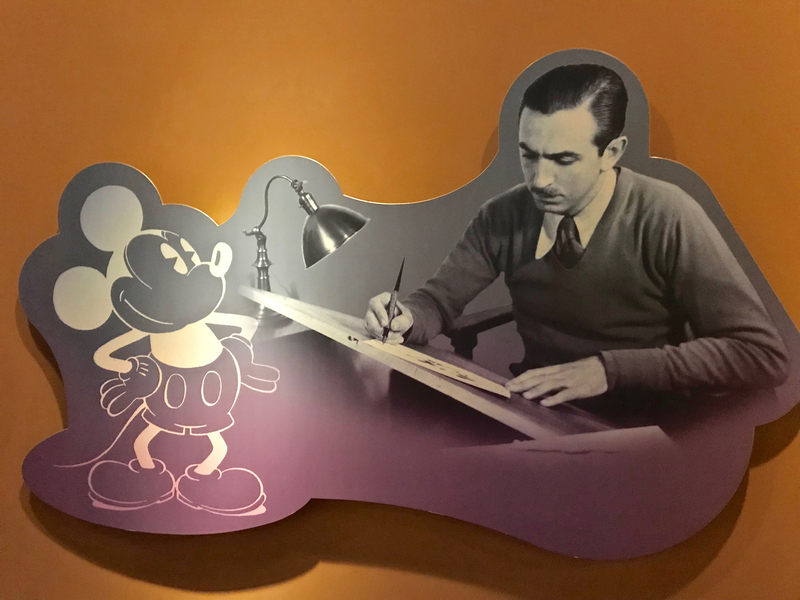 So far, there are some bits of "new" art and information about Walt Disney World Resort, and we will cover those in this and future Updates. One of the posts was the lineup for the Disney on Broadway Concert Series coming to Epcot during this winter's Epcot International Festival of the Arts, which we had already spotted on the Festival's section of DisneyWorld.com and added to our Epcot Calendar even before the "12 Days" story was posted. At least, as of Monday, there have been no really big "reveals" for Florida, but here's to hoping. 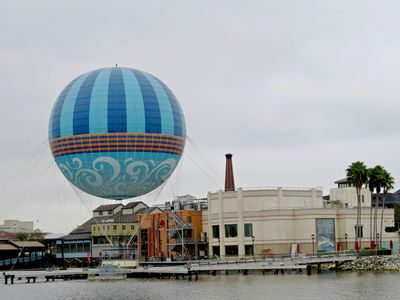 Back in July, at the Disney D23 Expo in Anaheim, we saw Disney confirm what their publicly-filed permits and local news reports showed: Walt Disney World Resort is building a new skyway comprised of gondolas connecting several resorts along with both Epcot and Disney's Hollywood Studios. 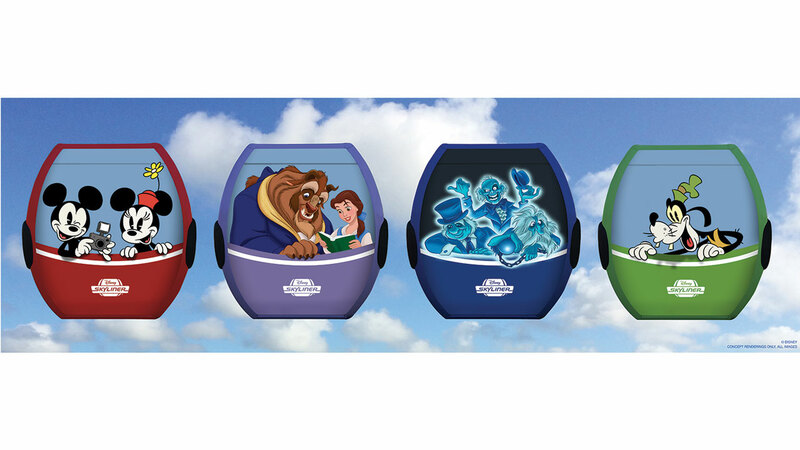 Specifically, as we reported in our Walt Disney World Resort Update for July 19-24, 2017, the new transportation system will be named the Disney Skyliner, and some of its cabins will have exterior graphics showing Disney characters appearing to ride along with guests. This week, Disney released additional concept art and details. Concept art shows some cabins will have exterior graphics showing characters like Mickey & Minnie, Beast & Belle, Hitchhiking Ghosts, and Goofy riding the Disney Skyliner. Image ©Disney. This past week, as part of its "12 Days of Disney Christmas" posts, Disney Parks Blog shared a few additional details and concept art about the transportation system and its stations. 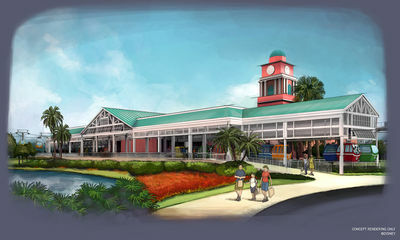 We already knew that the system will include stations at 1) Epcot's International Gateway in (more or less) the location the Epcot Resorts tram loading area once stood; 2) Disney's Caribbean Beach Resort; 3) Disney's Hollywood Studios; and 4) Disney's Pop Century and Art of Animation Resorts (shared station). 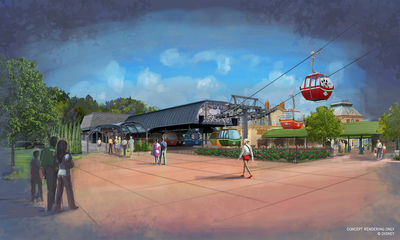 Now, Disney has shared concept art for the first three stations, and has noted that the Disney Skyliner will also feature a turn-station along Buena Vista Drive, where cabins slow down and riders can see the mechanical and aerial components that make up the ride system. For those old enough to remember the Magic Kingdom's skyway, it also included a similar turn station near the speedway as its cabins traveled between Tomorrowland and Fantasyland stations. Epcot International Gateway's station will be themed in a European Art Nouveau style similar to the existing buildings at the International Gateway, including metal and glass canopies, murals, and visible steel structures. Image ©Disney. Like the entrance of Disney's Hollywood Studios, which draws its appearance from the original Pan Pacific Auditorium in Los Angles, the station will be themed to blend in with the entrance and bus stations. Image ©Disney. 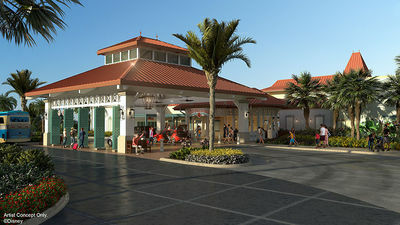 The station at Disney's Caribbean Beach Resort will serve as a transfer hub between destinations on the system. The waterfront area is being expanded, as discussed in the next news item below, to provide services to the influx of additional guests. Image ©Disney. Will the Disney Skyliner be complimentary for some or all guests? Will the Epcot International Gateway entrance itself be expanded to address the additional guests entering the park through what had previously been its "back door?" 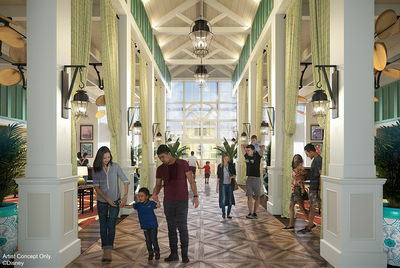 Will Disney's Riviera Resort, the new Disney Vacation Club property being developed on some of Disney's Caribbean Resort's prior footprint, have its own station or will its guests share the Caribbean Beach Resort's station? By way of examples, additional unanswered question categories we can add include: the maximum number of riders allowed per cabin, the cabin climate control or ventilation, the system's usual operating hours and, given that Central Florida experiences frequent electrical storms (and other storms ranging from drizzle to severe), the weather conditions in which the system ordinarily will be open. 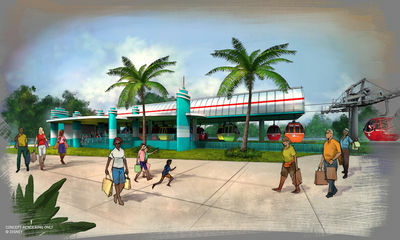 Granted, it is still early days, as Disney has yet to announce an opening date for the transportation system. 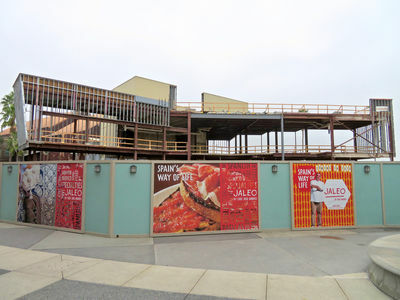 Construction appears underway all along its route and, as we show in this and other Updates, some of its structures will be visible from within Epcot and Disney's Hollywood Studios in order to provide riders with those touted "birds-eye" views. As regular readers may recall, Disney's Caribbean Beach Resort has had a significant, on-going transformation project underway for awhile. 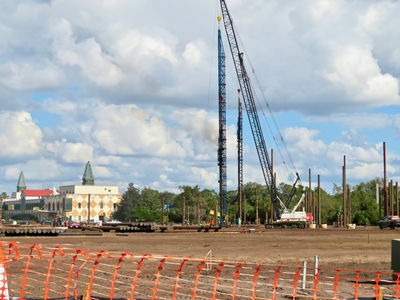 From the bulldozing of several of its original buildings, to the closing of its Centertown Market and other venues in its Old Port Royale area, and the on-going building of the new tower that will be Disney's Riviera Resort, the Resort is busy with construction activity. This past week, Disney Parks Blog provided additional details and concept art as part of its "12 Days of Disney Christmas" series. Disney's Caribbean Beach Resort expects to debut enhancements in late summer 2018. Image ©Disney. Rather than Custom House, Old Port Royale will be the reimagined "port of entry" for resort check in. When complete, it will also include an all-new Centertown Market for casual dining, an all-new Shutters restaurant offering waterfront dining adjacent to the new Banana Cabana outdoor bar and lounge, and Calypso Trading Post for shopping. 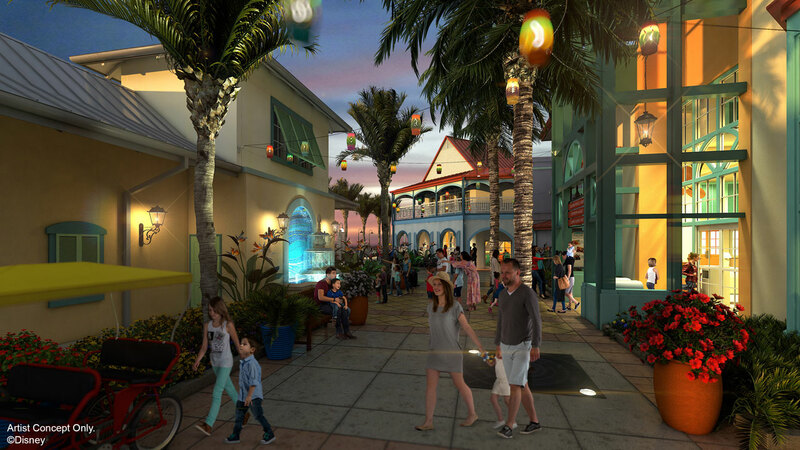 Old Port Royale will be the reimagined "port of entry" for Disney's Caribbean Beach Resort. Image ©Disney. Centertown Market is being expanded and enclosed to create a "quick-service restaurant with an indoor street market vibe." The venue's entrance under a large palapa-like structure will lead to an enclosed market accented with glowing colored light pendants made from glass bottles. With open shutters, wooden light posts, awnings, and ornamentation, the market will contain "unique" seating areas. Guests will also have access to the Grab n' Go market for a specialty coffee and quick bites. Centertown Market will be expanded and enclosed, creating a quick-service restaurant with an indoor street market "vibe." Image ©Disney. 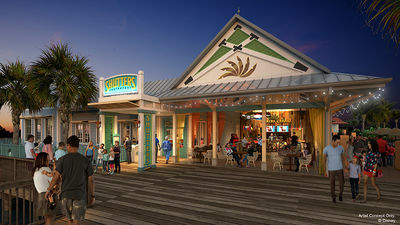 Shutters, a table-service restaurant, will be located on the waterfront of Old Port Royale with a Caribbean-inspired theme. It will feature large open shutters and "handmade items that appear as they've been found on the islands." Leaves and floral designs celebrate "the natural beauty of the Caribbean." Shutters, a "Caribbean-inspired" table-service restaurant, will be located on the waterfront of Old Port Royale. Image ©Disney. Banana Cabana will be the poolside bar. Cabana-style drapes will flank seating areas and re-purposed steel drums will illuminate a central communal table made from a wooden boat. Calypso Trading Post will sell Disney merchandise and sundries. 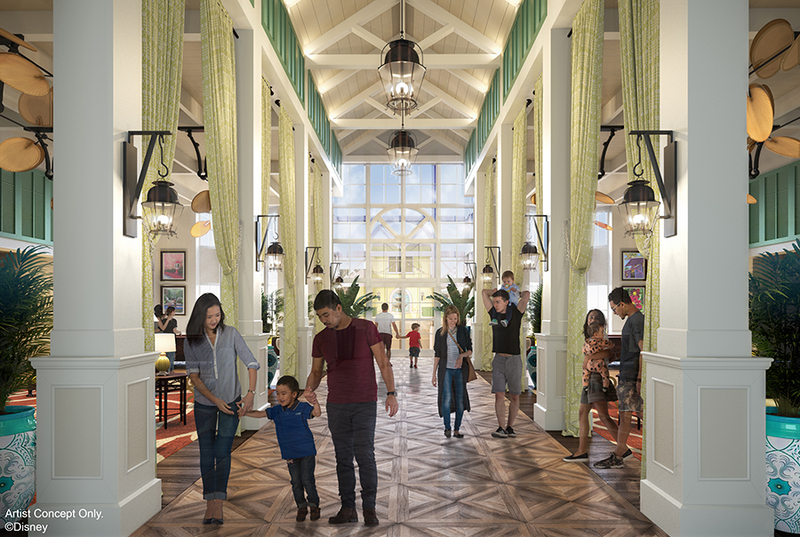 Disney expects enhancements at Disney's Caribbean Beach Resort to debut in late Summer 2018. The adjacent DVC project, Disney's Riviera Resort, is not expected to open until sometime in 2019. Disney's Animal Kingdom will celebrate its 20th anniversary on Earth Day, April 22, 2018. Yesterday, as part of its "12 Days of Disney Christmas" series, Disney Parks Blog announced that one of that park's opening day attractions, the Flights of Wonder show, will have its final performances on December 31, 2017. In Spring 2018, a new show will debut in the Caravan Theater in Anandapur village featuring Senior Wilderness Explorer Russell and his dog friend Dug from Disney-Pixar's animated feature UP. Disney has not said whether Kevin and her offspring (the bird friends from the movie) will make appearances during the show, but, like Flights of Wonder, the show will include Russell and Dug discovering "species of birds from around the world." 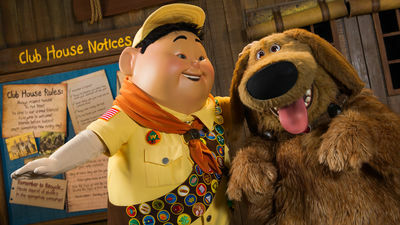 Russell and Dug from Disney-Pixar's "UP" will be featured in a new show at Disney's Animal Kingdom in Spring 2018. Image& ©Disney. The first ever Epcot International Festival of the Holidays runs through December 30. Less than three weeks later, the Epcot International Festival of the Arts makes its second bow January 12 until February 19, 2018 (more details this week in our Epcot Calendar below). 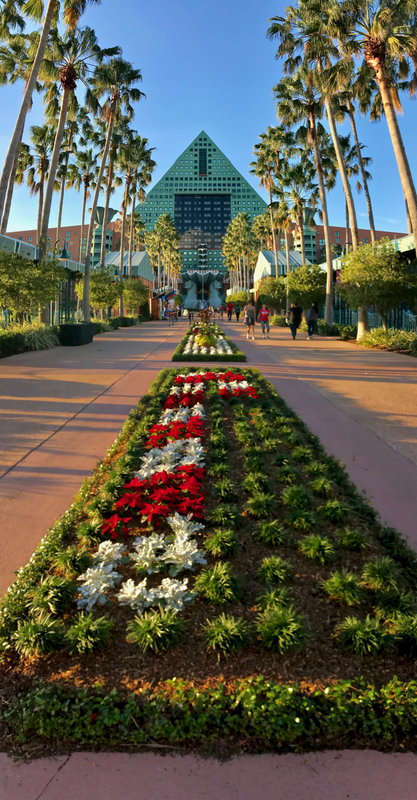 Ten days after that, the oldest of the Epcot festivals will begin its 25th annual salute to spring with the opening of the Epcot International Flower & Garden Festival. 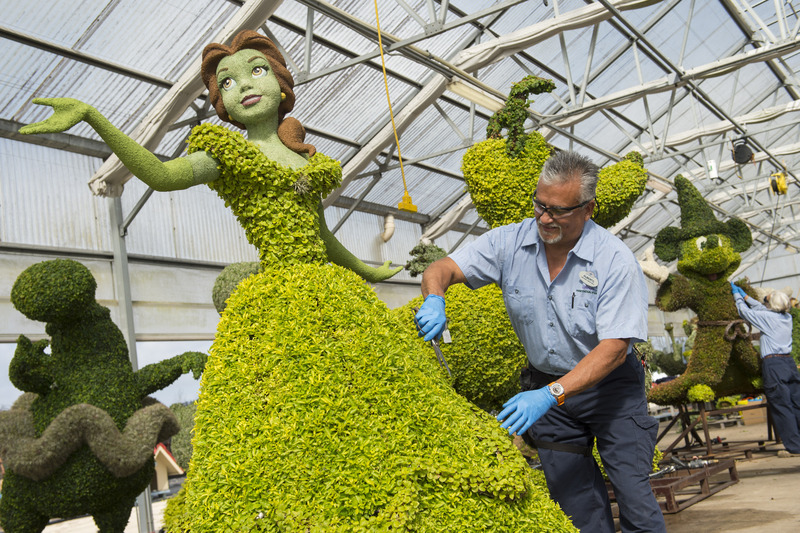 Topiary Belle will again appear at the France pavilion during the 2018 Epcot International Flower and Garden Festival. Photo ©Disney. Each of the Outdoor Kitchens will also feature either a raised-bed or in-ground garden of herbs and produce. "The culture of growing your own food continues to trend, and our guests each year have quite a few questions related to edible gardens," says Eric Darden, festival horticulture manager. "They get a big kick comparing items in our gardens with the herbs and produce our chefs incorporate into the festival’s Outdoor Kitchen recipes." 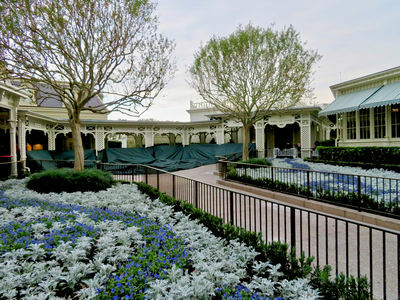 In addition to the nearly 100 festival topiaries, the park will show off at least 70,000 bedding plants around the Future World east and west ponds and 220 mini-gardens on the water. 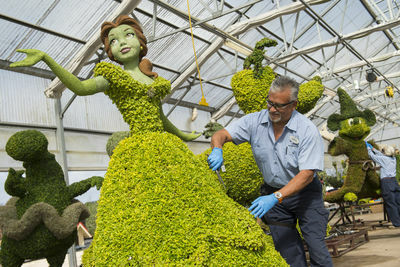 Dozens of "flower towers" and other multi-colored gardens will be on display as well. 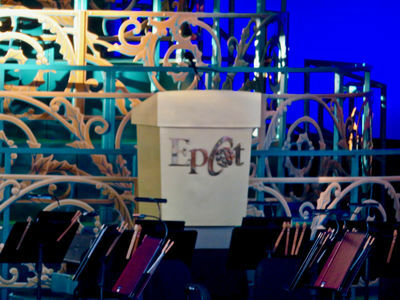 Later this winter, the Festival's webpages at EpcotInSpring.com will have more details and we will highlight them in due course. 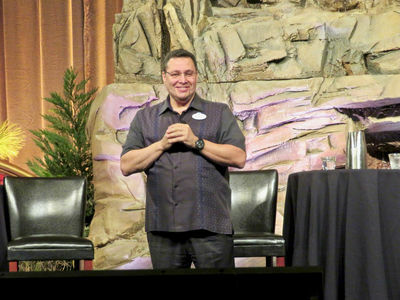 On Thursday, December 7, Disney Vacation Club held its Annual Meeting at the Convention Center at Disney's Contemporary Resort. As a condominium association, the required Annual Meeting is a legal formality that is necessary to approve minutes, resolutions, and budgets for Disney's timeshare and certain other operations. Of course, beyond the required scripted portions of the meeting, Disney conducts these meetings in a way rather unlike your local Condominium/Home/Co-op Owners Association meetings—with a themed stage, multi-media presentations, and a post-meeting reception featuring DVC leadership, holiday cookies, and Disney characters. Ken Potrock, Senior Vice President and General Manager of Disney Vacation Club and Adventures by Disney, addresses a near-capacity crowd of DVC Members and guests ahead of the Annual Meeting. Photo by Alan S. Dalinka. 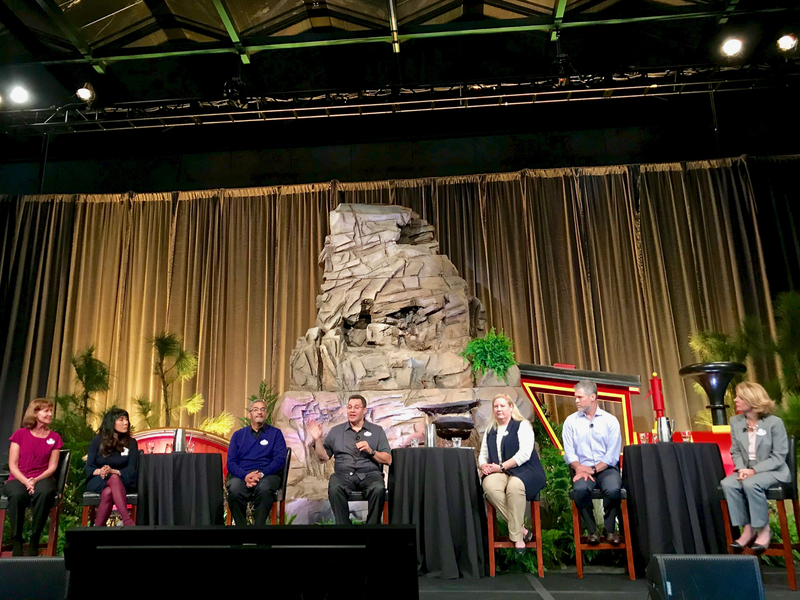 The stage for the meeting was set to reflect the decor of the Pacific Northwest in keeping with DVC's newest resort, Copper Creek Villas and Cabins at Disney's Wilderness Lodge (which Donald and Bonnie Fink visited on Opening Day back in July, and I also previously wrote about after a pre-opening Hard Hat Tour this past Spring). Perhaps of most interest to folks staying at Wilderness Lodge, Ken Potrock, Senior Vice President and General Manager of Disney Vacation Club and Adventures by Disney, noted that the soon-to-open Reunion Station will include concierge services and will offer beverage tasting sessions like those we previously wrote about at DVC's Top of the World Lounge, plus classes in subjects like photography. We will watch for additional details about schedules and prices to include in future Updates. 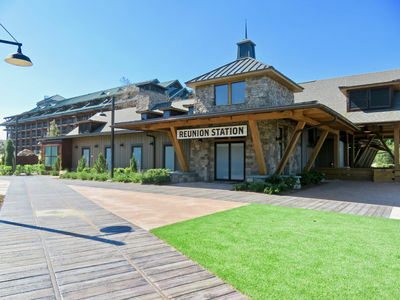 Reunion Station is located on the shore of Bay Lake at Disney's Wilderness Lodge. Behind it is the tower of the main Lodge building that was transformed into the new DVC Copper Creek Villas. File photo by Alan S. Dalinka. 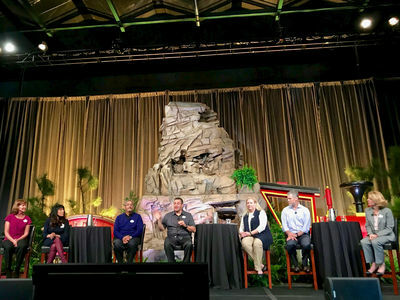 The designated "Members Voting Representative" and the Board of Directors of the associations within Disney Vacation Club conducted their formal (scripted) business proceedings on a stage set to resemble the Pacific Northwest along with a model train. Photo by Alan S. Dalinka. Even before the meeting, and, indeed, in time for last week's Update, DVC announced its plan to schedule its very popular Moonlight Magic Events (after-hours events in Disney Parks) in every month of 2018 through November. The January through October events will be held at Walt Disney World Resort, and the dates and reservations windows are now included within our Resort Events section in a subsection dedicated to Moonlight Magic. The November events will be held at Disney California Adventure at Disneyland Resort. Moonlight Magic and smaller features like the very popular DVC Members Lounge at Epcot which received 300,000 visitors in this past year, and the Beverage Tasting Series (and presumably the photography and other classes coming to Reunion Station), are part of DVC's Membership Extras which means that, particularly for recent purchasers, Members must have purchased their membership interests (points) directly from Disney in order to qualify to participate. These benefits will be advertised within the new "Stay Magical" marketing campaign in this coming year. Unlike your run-of-the-mill neighborhood condo/home/co-op owners association meeting, Disney themes a reception ballroom to greet Members after the formal proceedings. Photo by Alan S. Dalinka. DVC Members will be particularly interested to know about the two discount ticket offers now available to Members through January 3, 2018. See this page of DisneyVacationClub.com for details, but, in short, Members can purchase (for themselves or their household) the Platinum Plus Annual Pass at 25% off the regular price, and 7 days for the price of 5 days (single-park-per-day) tickets that Members have 6 months from first use to use (tickets must be first used by December 31, 2018, and final use may be no later than June 30, 2019). From personal experience this past week renewing my Platinum Annual Pass, with this offer, it was less expensive for me to renew at the discounted Platinum Plus DVC rate than it would have been to renew at the standard Platinum Pass for Florida Residents or DVC Members. Interestingly, DVC says that no Member Dues are used to produce special events like "Moonlight Magic" or the DVC Members Lounge. 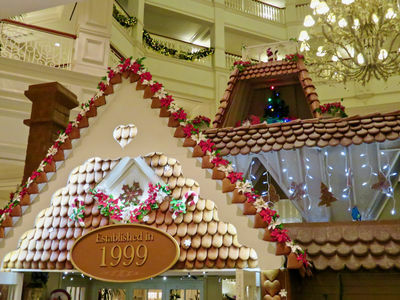 While Disney uses these "Extras" to distinguish DVC from other timeshare competitors, the benefits are always advertised with the accompanying disclaimer that folks should not buy their timeshare interest relying on the continued availability of the "Extras" which may change or be discontinued at any time. Of course, the legal nicety of the disclaimer does not diminish the fact that the current Membership Extras are being offered and, at least based on this Writer's experience, have been outstanding. 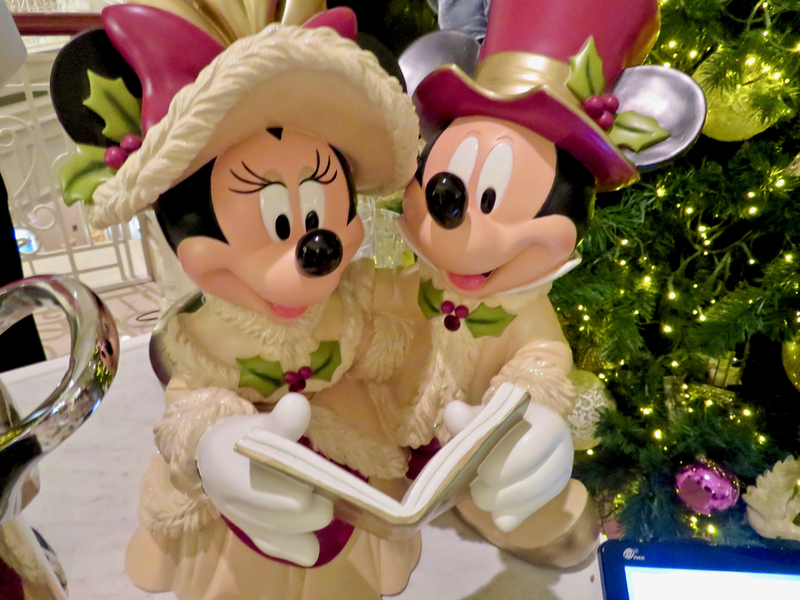 Minnie & Mickey Mouse greeted DVC Members at a reception following the Annual Meeting. Photo by Alan S. Dalinka. During the budget presentation, DVC confirmed that Hurricane Irma did have both direct and indirect impact on the associations. Like last year's Hurricane Matthew, both Vero Beach and Hilton Head were required to close for a time because of damage sustained by Hurricane Irma, and Irma also inflicted damage at Saratoga Springs at Walt Disney World. The loan from Walt Disney Company to Disney Development obtained last year for repairs at Hilton Head was extended by a year to reflect the additional damage sustained under DVC's self-insured retention (owner repair obligation like a deductible) of $1 million in combined damage per named storm. The indirect effect of the Hurricanes on DVC properties (and, by extension on Walt Disney World itself) is that, in the wake of the storms, construction costs increase to reflect the increase in demand for rebuilding and otherwise. Those increased construction costs effect not only repairs, but the scheduled refurbishments scheduled at the DVC properties themselves. Even with the hurricane, DVC remains committed to the more robust refurbishment in seven year cycles introduced this year. The major refurbishment of Disney's Vero Beach Resort is now complete. 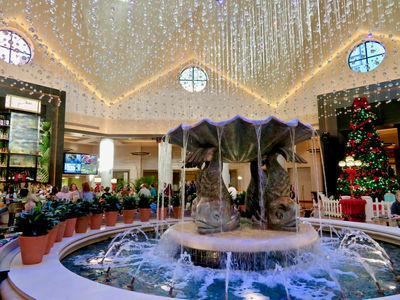 Old Key West will be the next to undergo the full, scheduled rehab. 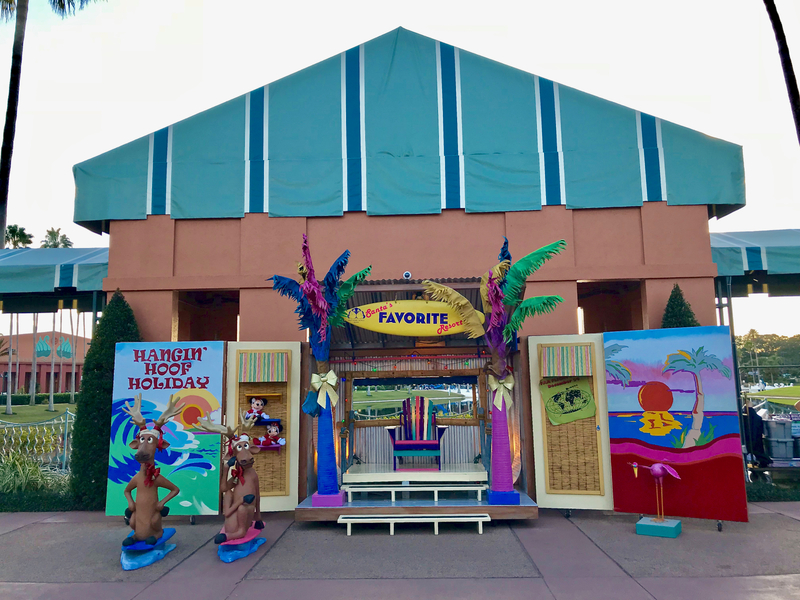 As was done with Old Key West, prototype models will be assigned to some guests at Saratoga Springs during 2018 to gather feedback for the full refurbishment scheduled there for 2019-20. Approximately two thirds of membership dues are comprised of operating expenses, with the rest coming from ad valorem (property) taxes, and reserves for future capital projects. The estimated assessments per point for 2018 run from $5.86 for Disney's Saratoga Springs up to $8.53 at Disney's Vero Beach. Excluding Copper Creek, the increases over 2017 vary by location and range from 1.1% (Polynesian) to 7.1% (Aulani). 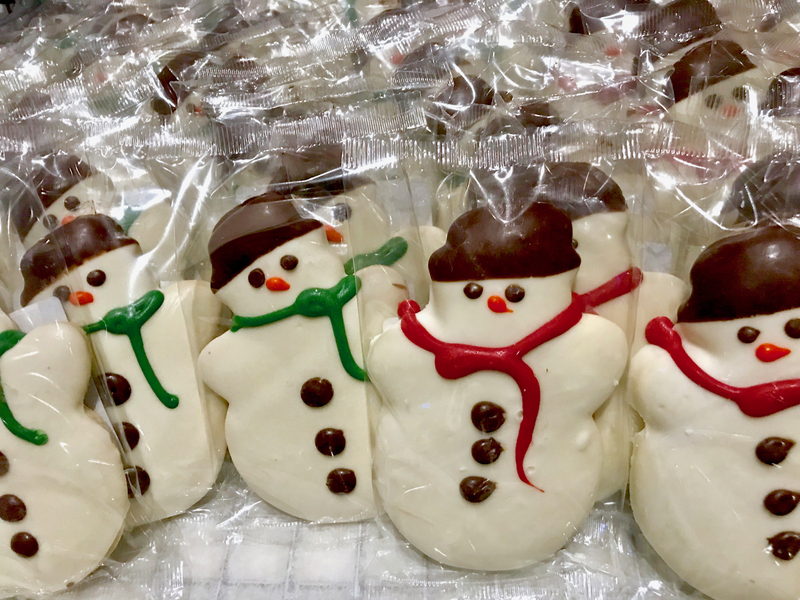 Holiday themed cookies are a regular highlight of the post-meeting reception at the DVC Annual Meeting. Photo by Alan S. Dalinka. Going forward, DVC committed to finally "getting the sofa beds right" and for providing two firm and two soft pillows on every bed. A new emphasis on improving housekeeping began at Bay Lake Tower and, after feedback, DVC will bring it to the rest of the properties. Other amenities also will be improved and/or enlarged at the resorts (also accounting for some of the increase in dues). Enhanced and expanded wi-fi bandwidth (though without a specific timeframe) is also coming to DVC resorts. A winter themed Mickey Mouse statue also greeted DVC Members at the reception following the Annual Meeting. Photo by Alan S. Dalinka. Writer's note I have personally been a DVC Member since 2000. MouseAdventure returns to Walt Disney World this spring on March 3, 2018 with MouseAdventure: Tails, presented by Third Gate Games with media sponsor MousePlanet. Teams will explore the nooks, crannies, nests, and burrows of Disney's Animal Kingdom Park to solve a series of puzzles, gathering clues from among its residents, both real and imaginary. See the park in a whole new way as you discover patterns and details you never noticed before. 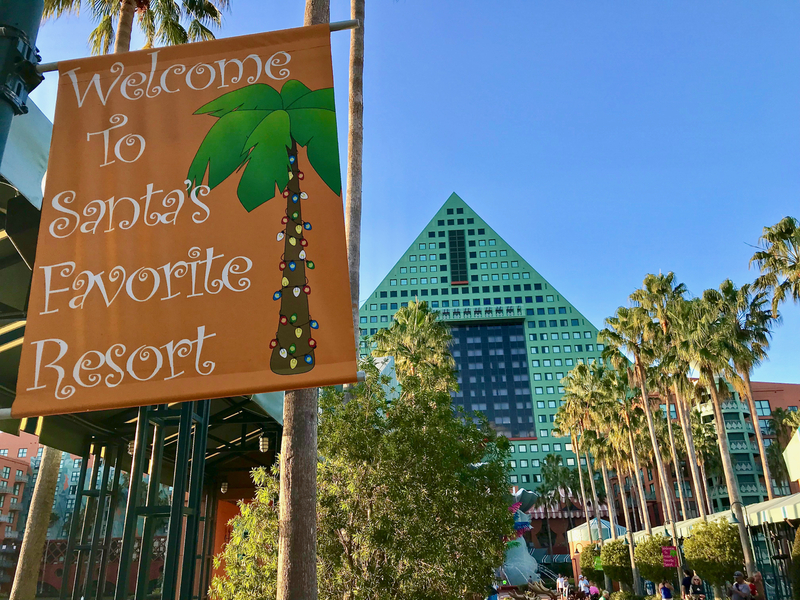 You can read about this past spring's event, The Florida Project, which was held at the Magic Kingdom and its resorts on MousePlanet. Registration will open on January 9 at 9 a.m. Pacific Time at mouseadventure.com, so set a reminder and make sure you are registered in the Third Gate Games forums. Join us and unearth the tales hidden in MouseAdventure: Tails at Disney's Animal Kingdom. Are you game? 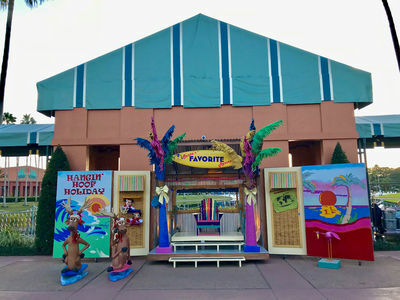 The America Gardens Theatre on the shore of World Showcase Lagoon opposite the entrance to The American Adventure is home to numerous shows throughout the year. 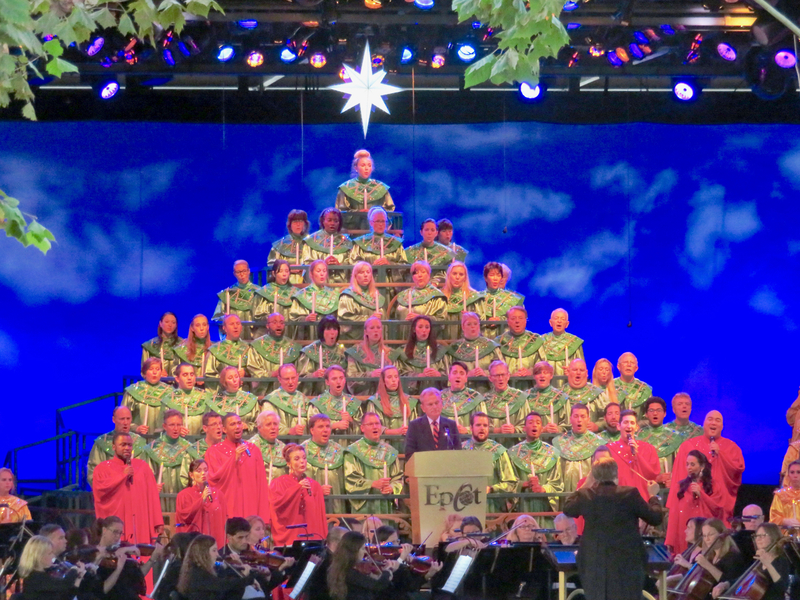 The nightly Candlelight Processional continues its performances there through December 30, and then, starting January 12, the Disney on Broadway Concert Series takes the stage Fridays through Mondays during the Epcot International Festival of the Arts. 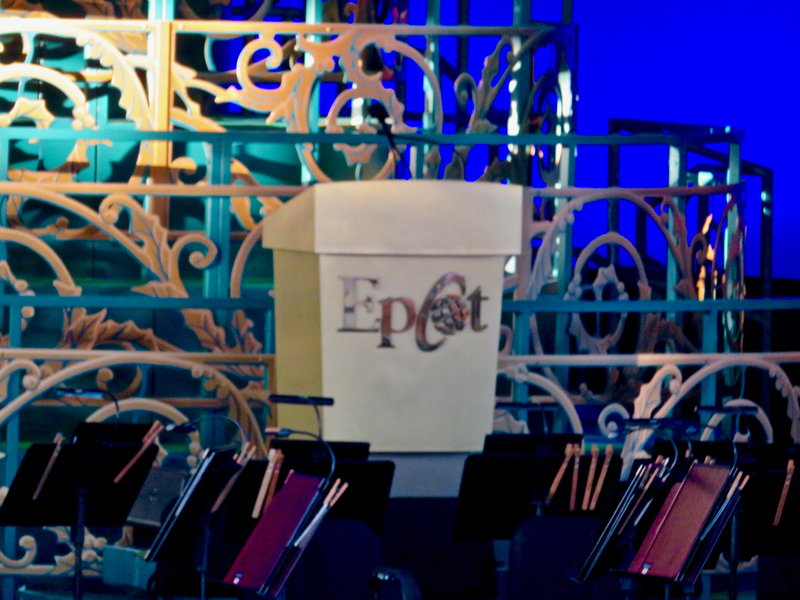 This past week, Walt Disney World updated its Epcot International Festival of the Arts webpages with the complete list of Disney on Broadway Concert Series performers scheduled during the Festival. The concerts, which were very popular during their debut in 2017, are scheduled to include top-notch Broadway performers singing songs from Disney Broadway shows. New to the Festival this year is Kara Lindsay; the rest of the performers appeared last year as well. 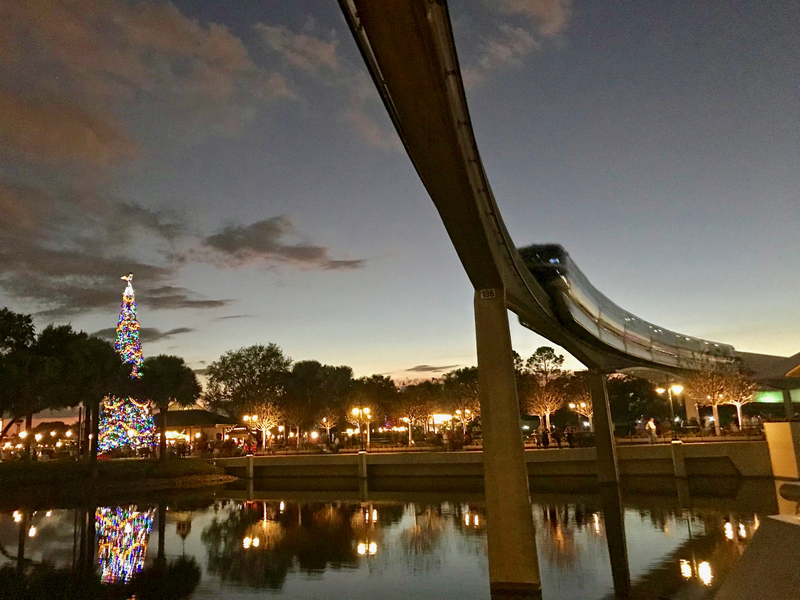 For the convenience of our readers, we have added these performances to the scheduled celebrity narrators for Epcot's Candlelight Processional during the Epcot International Festival of the Holidays in our Google Calendar of Epcot Events. You can also add it to any Calendar that supports the iCal format (like iPhone and Mac) by copying this link. Candlelight Processional continues nightly through December 30. Photos and video from this past week are in the Views Around the World below. Photo by Alan S. Dalinka. The week since we last published an Update kicked off with a small special event celebrating Walt Disney's 115th birthday with the Walt Disney World Ambassador Team and the folks on Disney's Guest Services team who run @WDWToday. 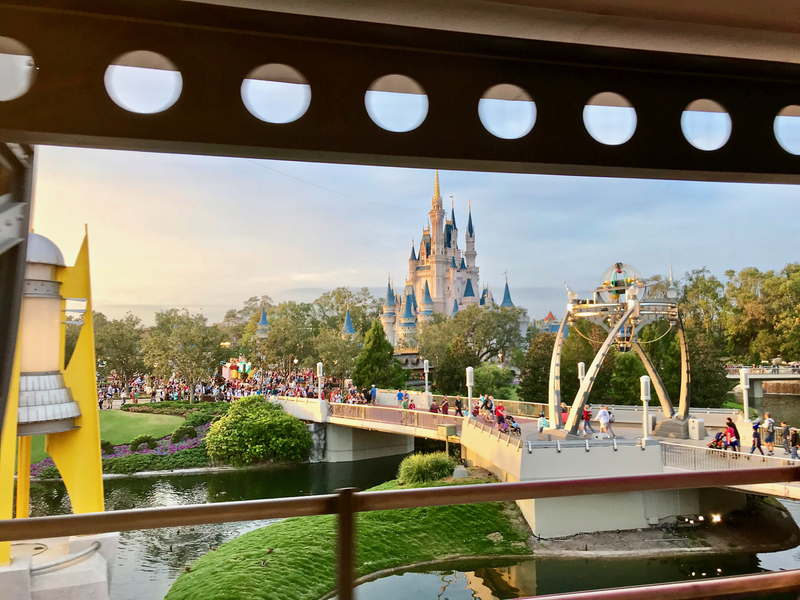 We also have views from Magic Kingdom, Epcot (with additional ones embedded via Twitter from last night's DVC Moonlight Magic event), and Disney Springs. 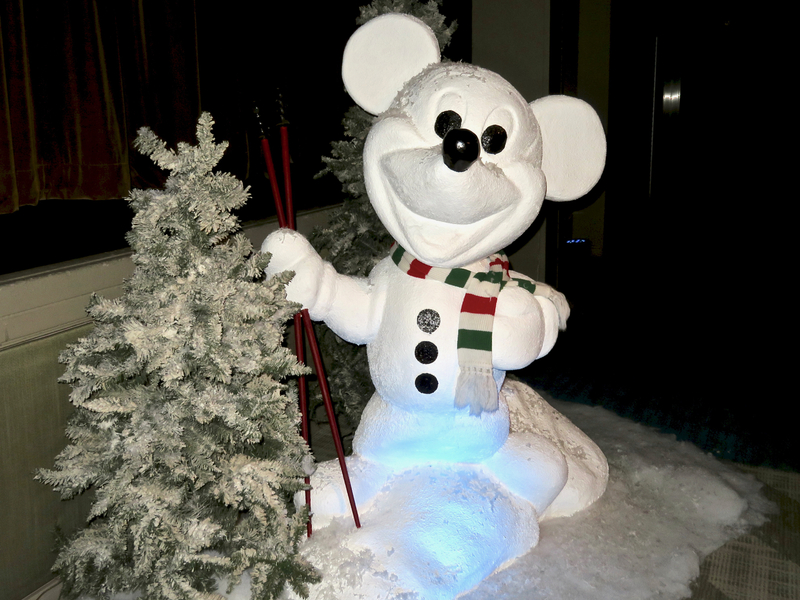 We then pick up where we left off last week with our look around at the holiday decor around the Resort. As always, bits of news are amongst the photo captions too. 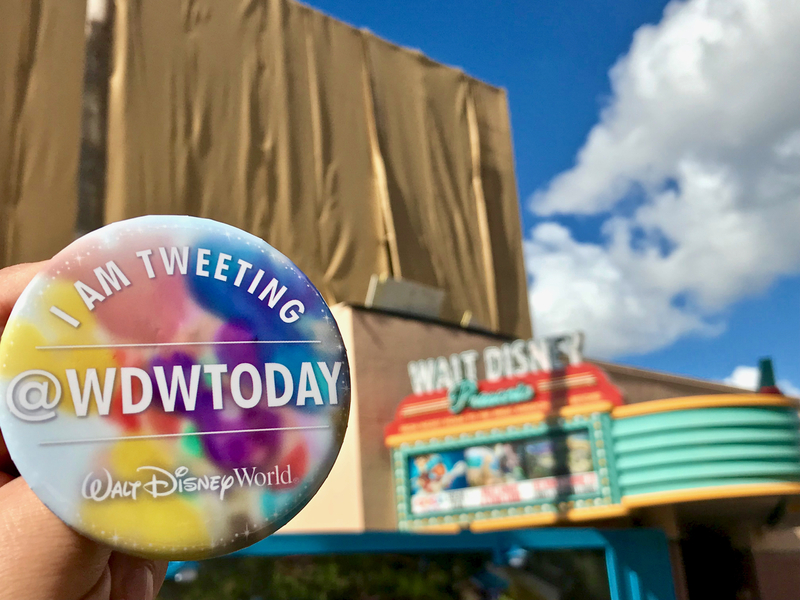 As a special celebration of Walt Disney's 115th birthday, the folks that tweet on behalf of Walt Disney World's guest relations team (@WDWToday), held a meet-up on December 5 with the Walt Disney World Ambassador Team at Walt Disney Presents in Disney's Hollywood Studios. Photo by Alan S. Dalinka. 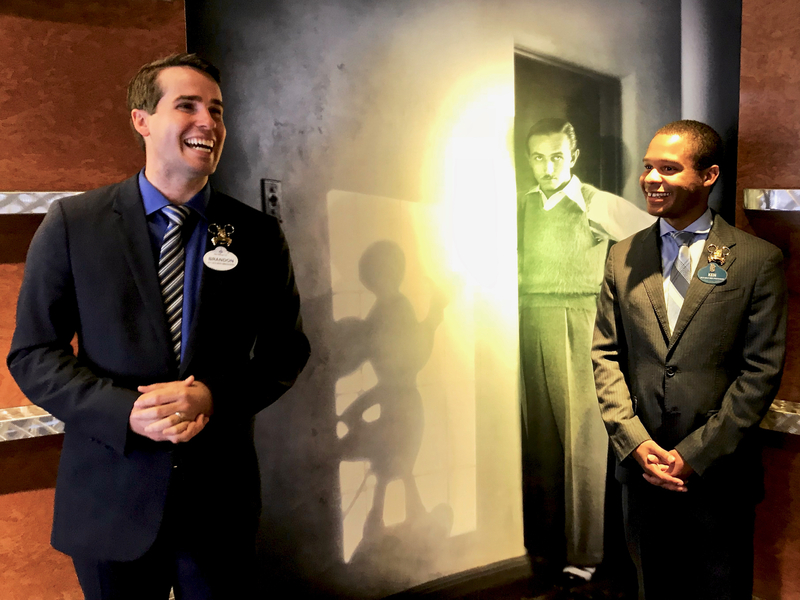 The 2017-18 Walt Disney World Ambassador Team of Brandon and Ken conducted two tours for guests inside Walt Disney Presents celebrating the life of Walt Disney on the anniversary of his birth. Photo by Alan S. Dalinka. Opened as One Man's Dream to celebrate Walt Disney's 100 birthday and recently renamed Walt Disney Presents, Disney's Hollywood Studios continues to be home to a mini-museum display about the life and work of Walt Disney. Photo by Alan S. Dalinka. As the busy holiday season approaches, the PeopleMover will remain a great way to observe the growing crowds. Photo by Alan S. Dalinka. On nights when Magic Kingdom hosts Mickey's Very Merry Christmas Party, Main Street U.S.A. balloon vendors include holiday themed balloons with the more traditional Disney Parks balloons. Photo by Alan S. Dalinka. 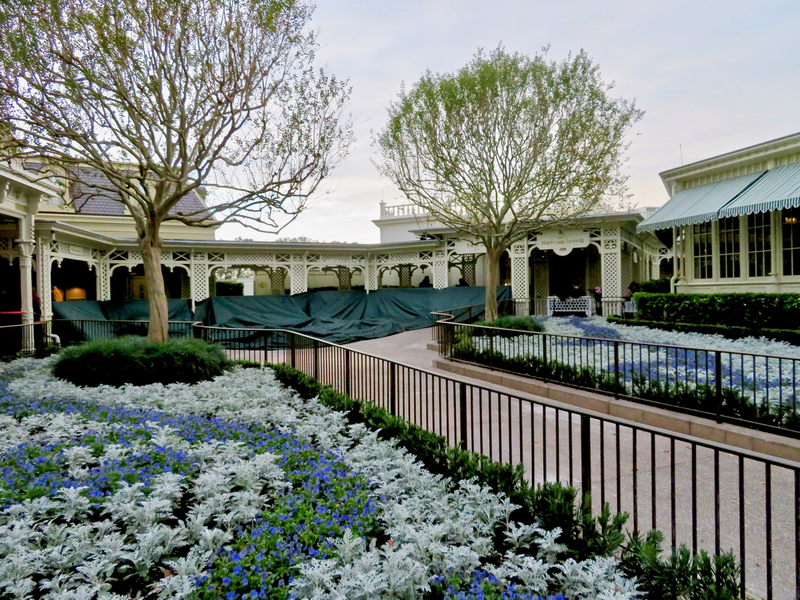 The fountain near First Aid on the west side of Main Street has been removed. It is likely that these renovations will assist with traffic flow on this side of Main Street as the eastern backstage overflow route probably will not be available during construction of the new Broadway-caliber theater construction behind the west side of Main Street. Photo by Alan S. Dalinka. If assigned to park on the eastern side of Epcot's parking lot and walk toward the park gates, on the left, beyond the tramway that crosses in front of the park, lots of evidence of construction can be seen in the backstage areas of Future World. Photo by Alan S. Dalinka. In Future World's Mouse Gear, the rose gold ears headbands that folks are clamoring for are now stocked in larger quantities. Photo by Alan S. Dalinka. The monorail passes Epcot's main Christmas tree in the middle of its circle tour of Future World. Photo by Alan S. Dalinka. Last week we showed photos of the same black structure from the Disney's Hollywood Studios side of Buena Vista Drive; here, it seen here behind Morocco pavilion when viewed from Future World. It appears to be related to construction of the Disney Skyliner. Photo by Alan S. Dalinka. 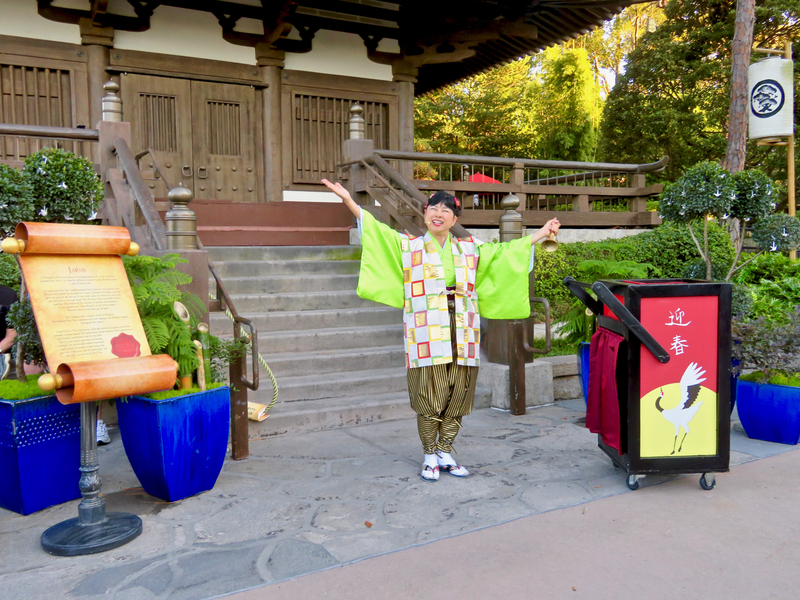 The Duruma Storyteller at the Japan Pavilion explains the Japanese tradition of ringing in the new year. Photo by Alan S. Dalinka. Pat Sajak made his debut performances as the celebrity narrator at Candlelight Processional last week. Photo by Alan S. Dalinka. Earlier this fall, Pat Sajak recorded episodes of Wheel of Fortune at Epcot as well—watch your local listings for the next week of those episodes starting February 12, 2018. Photo by Alan S. Dalinka. 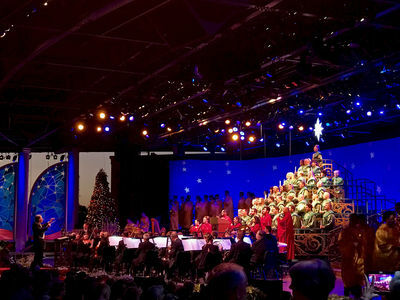 At the conclusion of a performance of Candlelight Processional, the mass choir files offstage as the orchestra, Voices of Liberty, and cast member choir continue to perform. Photo by Alan S. Dalinka. 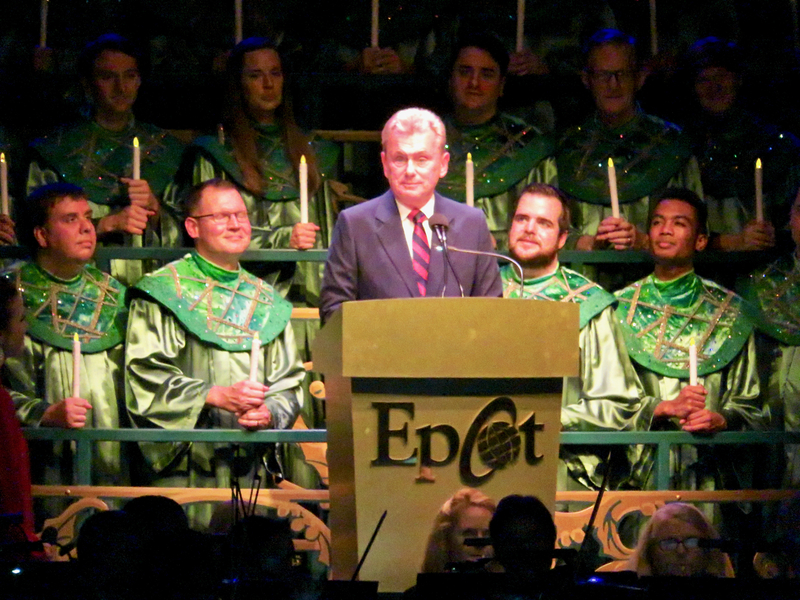 Enjoy the processional part of Epcot's Candlelight Processional and the introduction of Celebrity Narrator Pat Sajak. Video by Alan S. Dalinka. 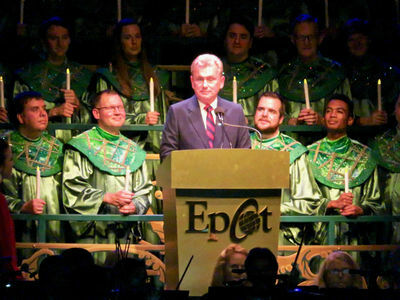 Highlights from last night posted by @AlanDalinka on Twitter, including Disney Legend Kurt Russell as Celebrity Narrator at Candlelight Processional. 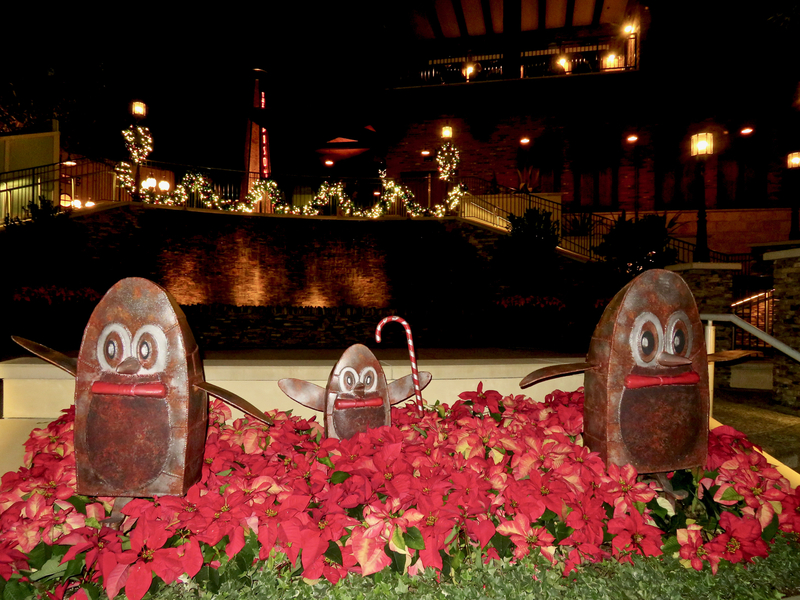 It is holiday season number two of the reimagined Disney Springs and these characters are back. (Seriously, does anyone know what they are supposed to be?) Photo (and genuine question) by Alan S. Dalinka. Vertical construction has begun along Buena Vista Drive next to the Casting building at the site of the future third parking structure for Disney Springs. Photo by Alan S. Dalinka. 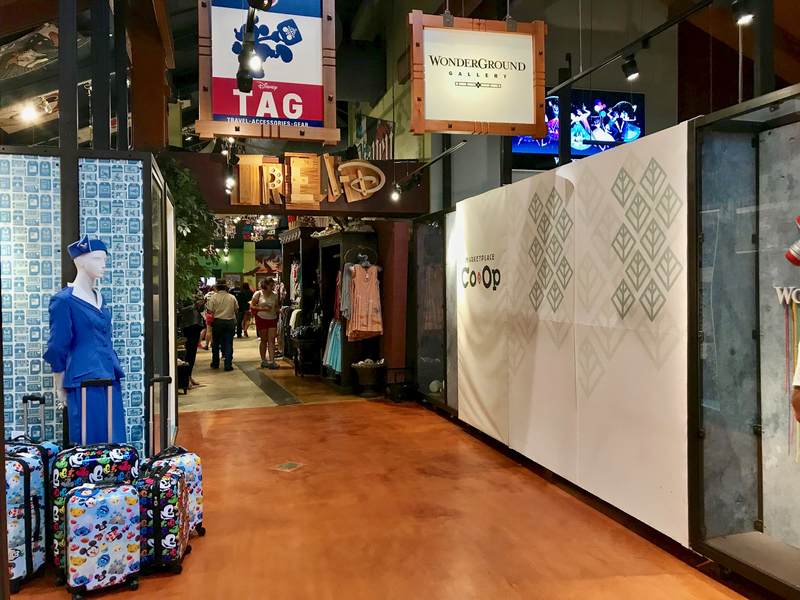 TAG and WonderGround Gallery have swapped spots inside the Marketplace Co-op. Photo by Alan S. Dalinka. 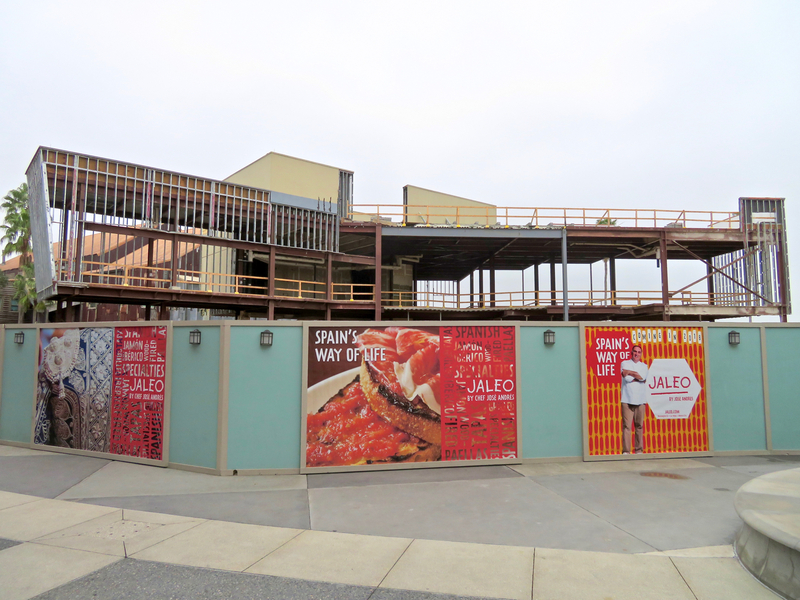 The new Spanish cuise restaurant Jaleo continues construction in the former Wolfgang Puck Grand Café site on the West Side. Photo by Alan S. Dalinka. 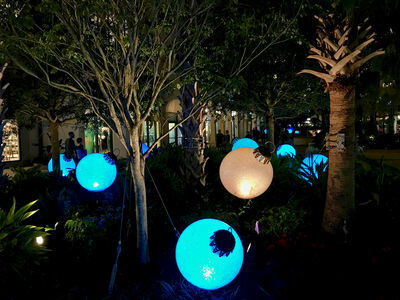 Lighted ornaments in the Town Center area change colors from time to time. Photo by Alan S. Dalinka. 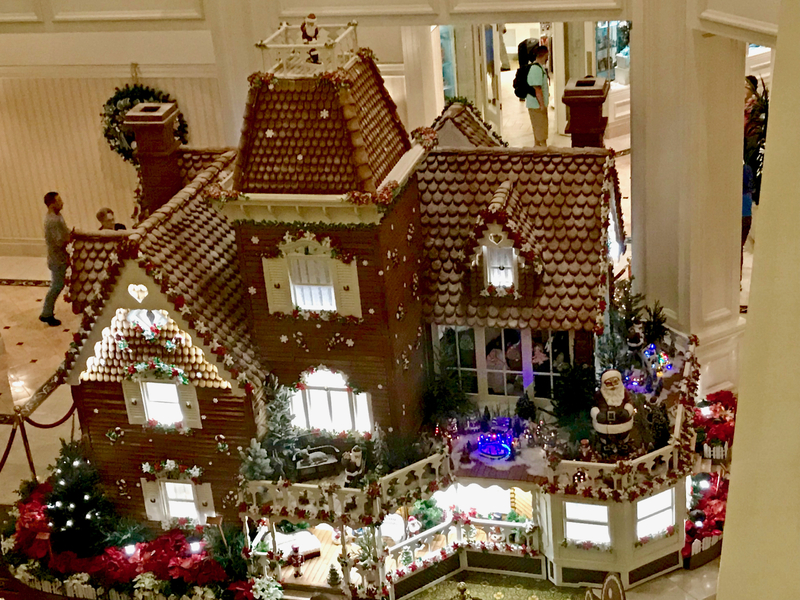 The lobby of Disney's Grand Floridian Resort & Spa contains many themed decorations for the season, including Victorian Era-attired Minnie & Mickey Mouse figures. Photo by Alan S. Dalinka. As we showed last week, at Disney's Grand Floridian Resort & Spa, the giant gingerbread house is back for the holidays. Photo by Alan S. Dalinka. 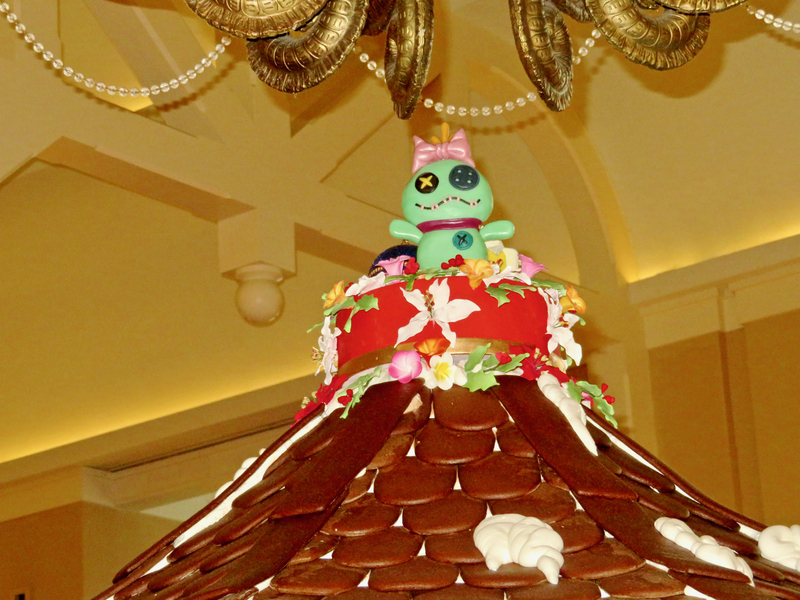 This week, we share a closer look at the work of the Resort's pastry team. Photo by Alan S. Dalinka. 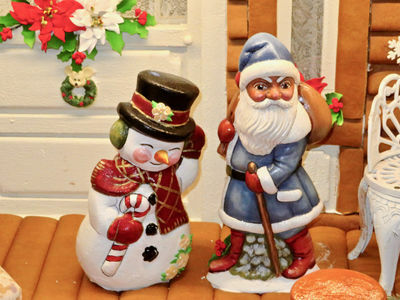 As in past years, the "house" is big enough that includes a shop selling baked holiday treats. Photo by Alan S. Dalinka. 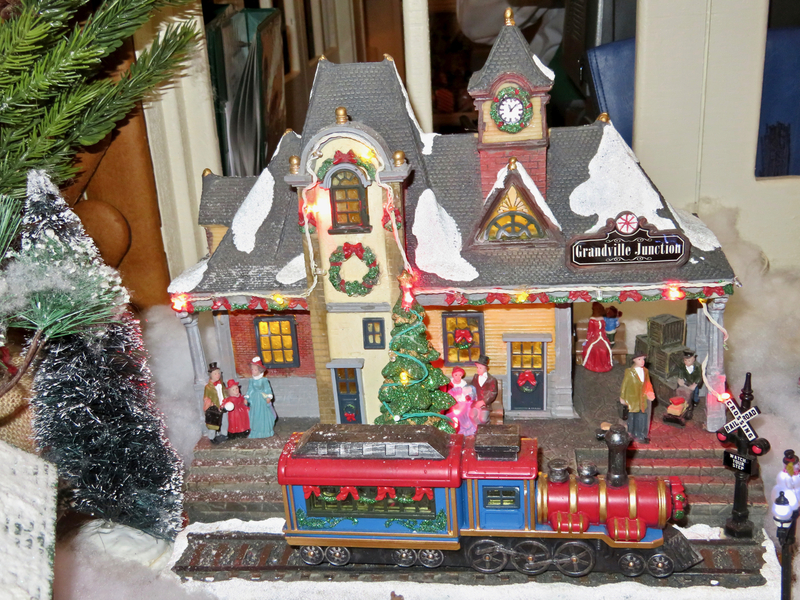 Attention to detail is a hallmark of the annual display. Photo by Alan S. Dalinka. The pastry team even creates facial expressions with traditional baking ingredients. Photo by Alan S. Dalinka. 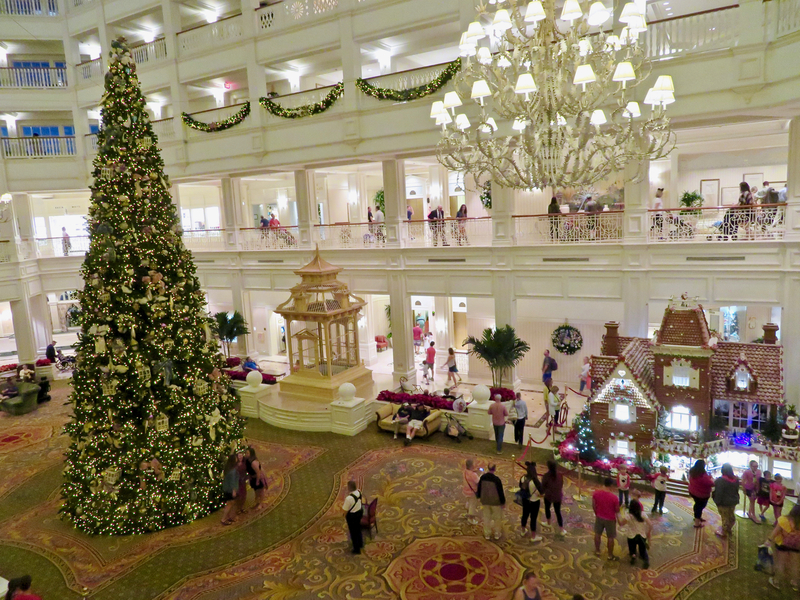 As is true of the Grand Floridian Resort itself, the display draws upon the Victorian Era for its details. Photo by Alan S. Dalinka. 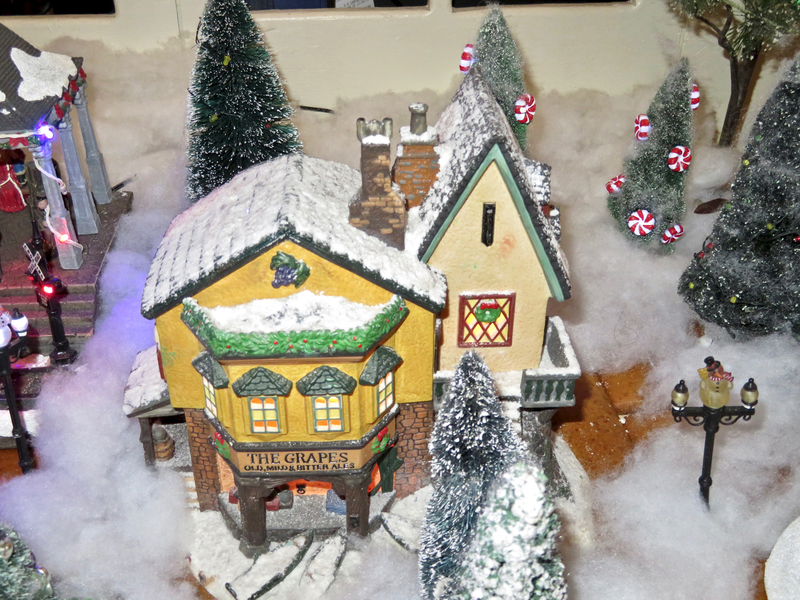 As with most Disney details, there is likely a story to explain why the tavern is named "The Grapes: Old, Mild, and Bitter Ales," but we do not know it. Photo by Alan S. Dalinka. 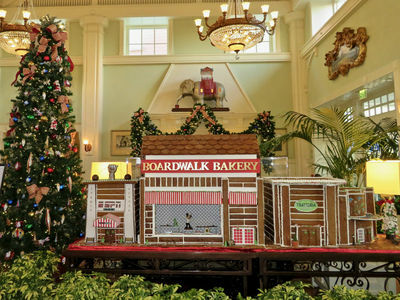 We end our look at Disney's Grand Floridian's gingerbread house with the pastry team's version of Disney "snow." Photo by Alan S. Dalinka. 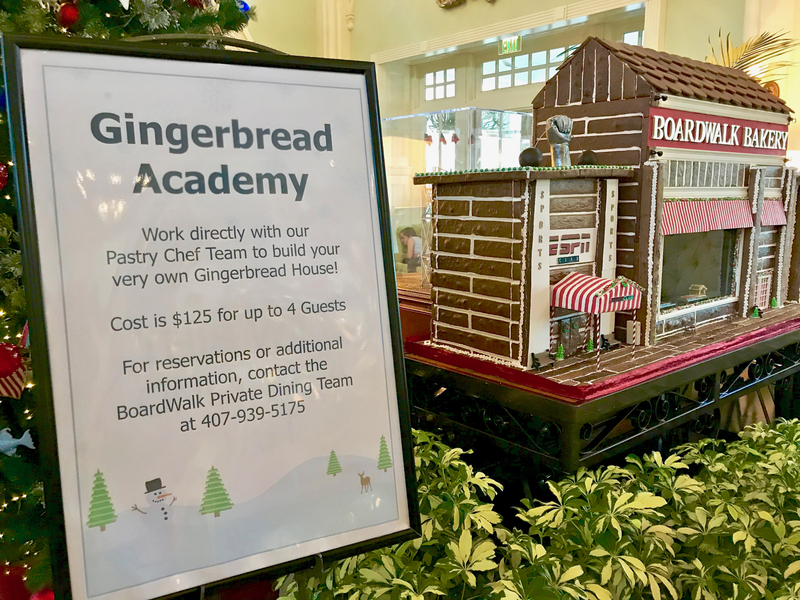 Over in the Epcot Resorts area, at Disney's BoardWalk, last week we showed this sign in the lobby of Disney's BoardWalk Resort announces the opportunity to build your own Gingerbread House with the Pastry Chef Team at the resort. For reservations, call (407)939-5175. The cost is $125 for a party of up to four guests. Photo by Alan S. Dalinka. 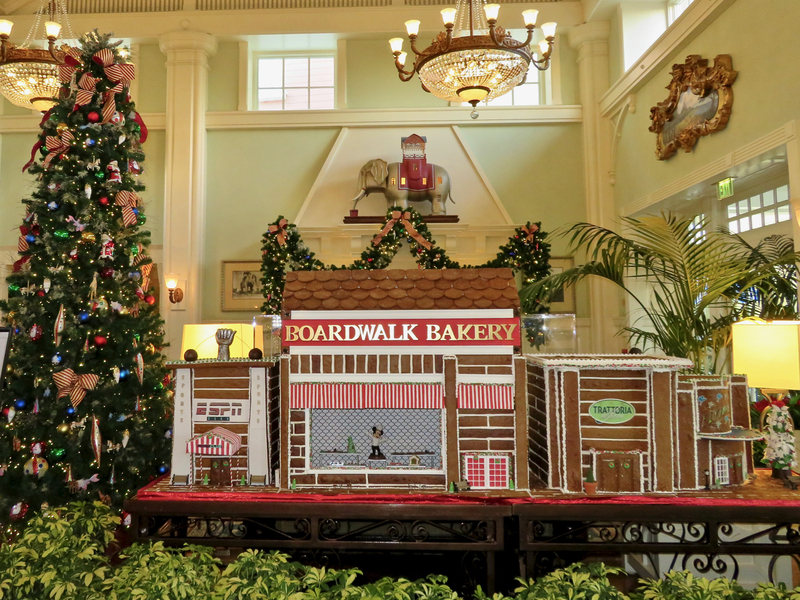 The gingerbread display in BoardWalk's lobby recreates some of the buildings along the boardwalk itself. Photo by Alan S. Dalinka. 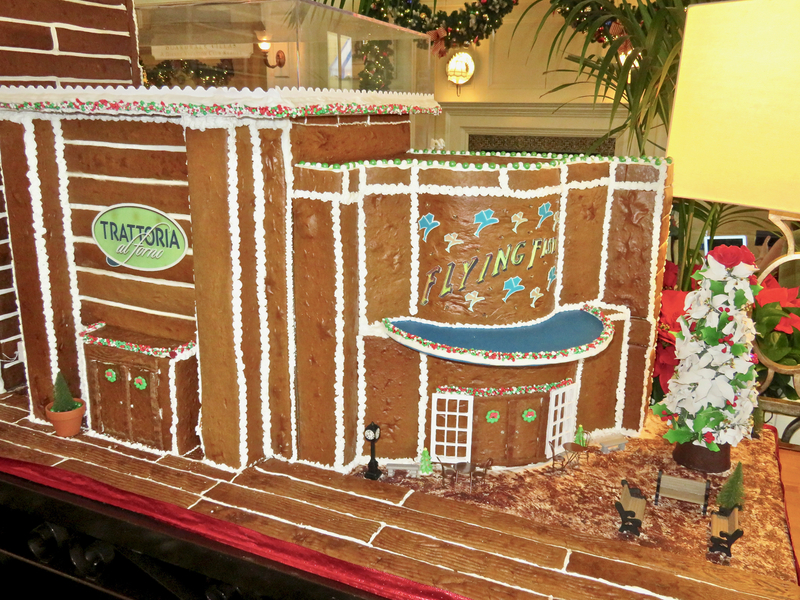 The curved entrance of Flying Fish has been recreated by the pastry team as well. Photo by Alan S. Dalinka. 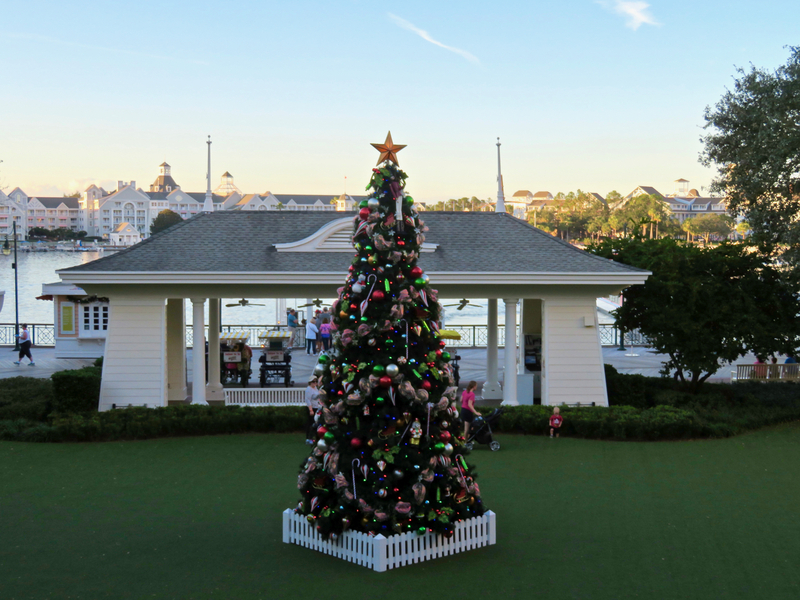 A Christmas tree stands on the "lawn" between the lobby and the boardwalk. Photo by Alan S. Dalinka. 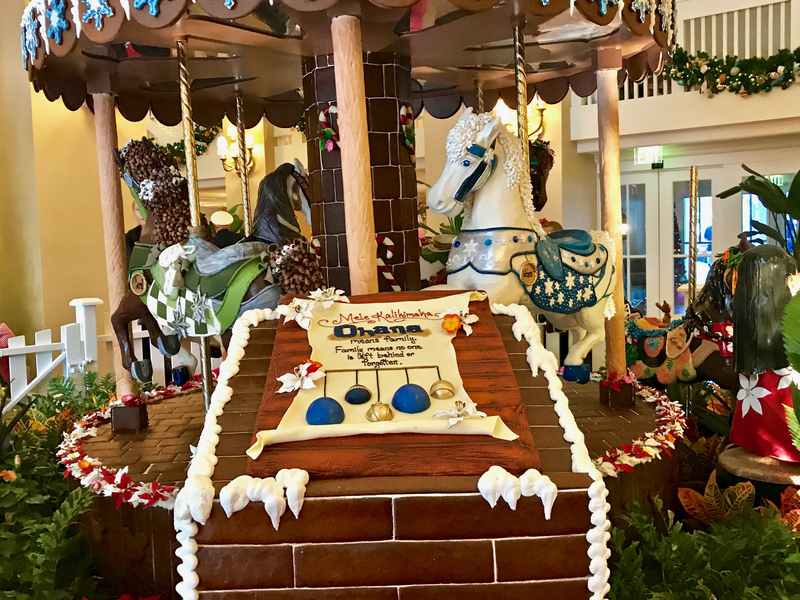 Continuing our tour around the Epcot Resorts, the lobby of Disney's Beach Club once again includes the pastry team's creation of a carousel. 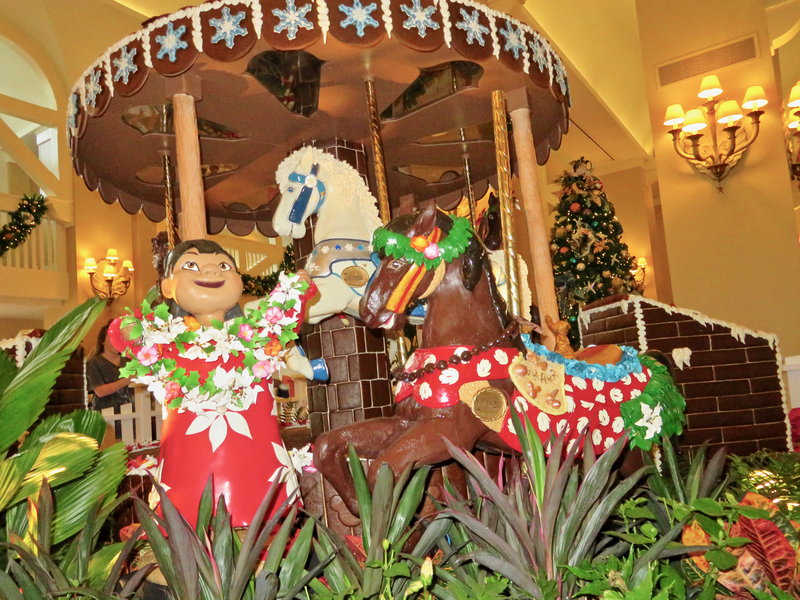 This season, like Disney's Polynesian Village Resort does year round, the lobby celebrates "Ohana," which means "family." Photo by Alan S. Dalinka. Not surprisingly, celebrating "Ohana" at a Disney resort includes Stitch. Photo by Alan S. Dalinka. 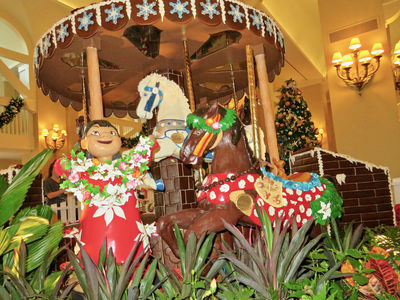 Lilo also celebrates "Ohana" at Disney's Beach Club. Photo by Alan S. Dalinka. Themed details extend all the way to the top of the carousel. Photo by Alan S. Dalinka. 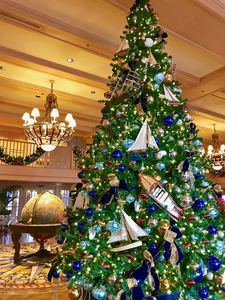 Next door, the central Christmas tree in the lobby of Disney's Yacht Club celebrates, of course, yachting and the sea. Photo by Alan S. Dalinka. 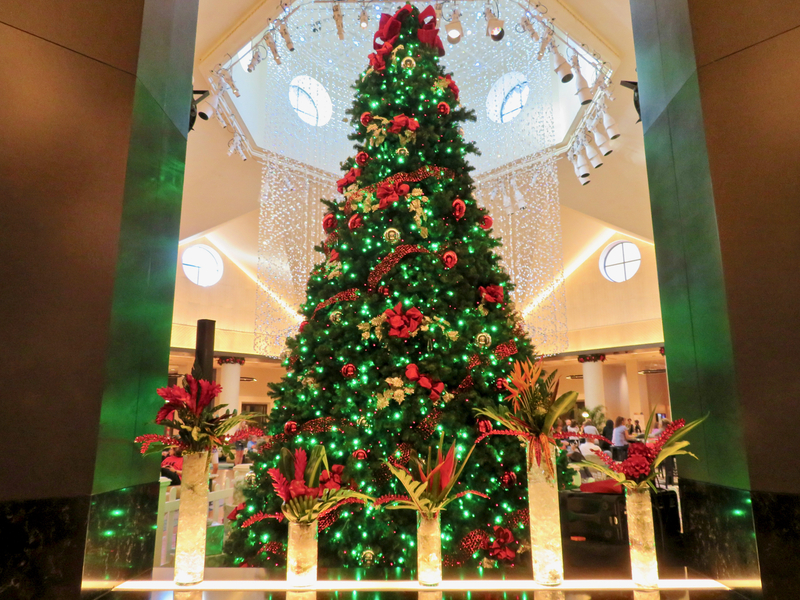 Continuing around to the Walt Disney World Dolphin Resort, a large tree stands near the new chandelier. 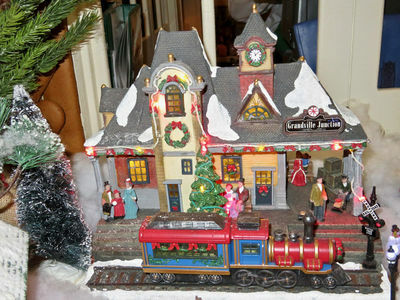 This Thursday through Sunday (December 14-17), Mrs. Claus and Kandy Kane will host a Christmas Tree lighting at 6 p.m. They will return December 21-23. Photo by Alan S. Dalinka. The new chandelier above the dolphin fountain remains the main focus of the new Phins lobby bar. Photo by Alan S. Dalinka. 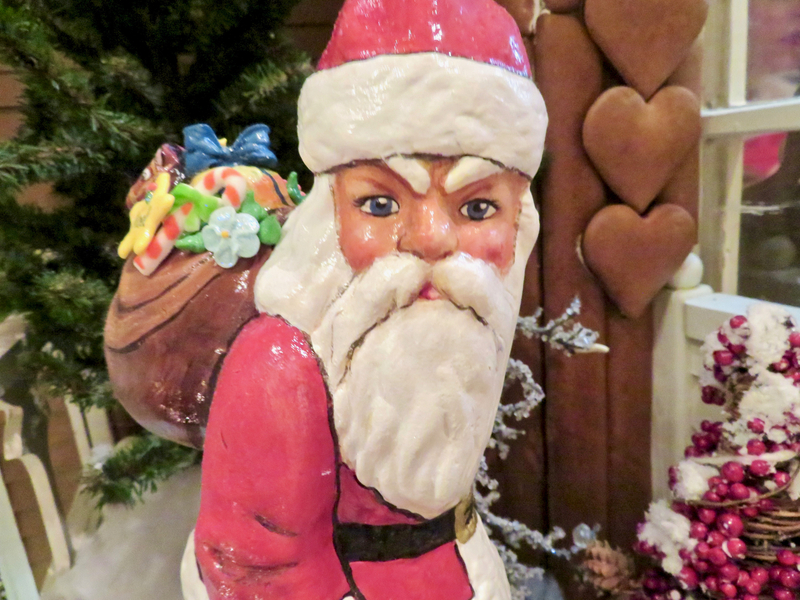 Santa and Mrs. Claus appear for photos and other holiday "surprises" under the "Santa's Favorite Resort" sign this Thursday through Sunday (December 14-17) from 6:15 p.m. until 8:00 p.m. on the causeway at the Walt Disney World Swan and Dolphin Resort. (They will return December 21-23 as well.) Photo by Alan S. Dalinka. The Michael Graves Causeway, dedicated in April 2015 to the memory of the architect that designed the Walt Disney World Swan and Dolphin Resort, connects the Swan and Dolphin hotel buildings. Photo by Alan S. Dalinka. Signs along the causeway between the Swan and Dolphin say "Welcome to Santa's Favorite Resort." Photo by Alan S. Dalinka. The plantings in the center strip of the causeway also have a holiday theme when viewed from the right angle. Panoramic Photo by Alan S. Dalinka. 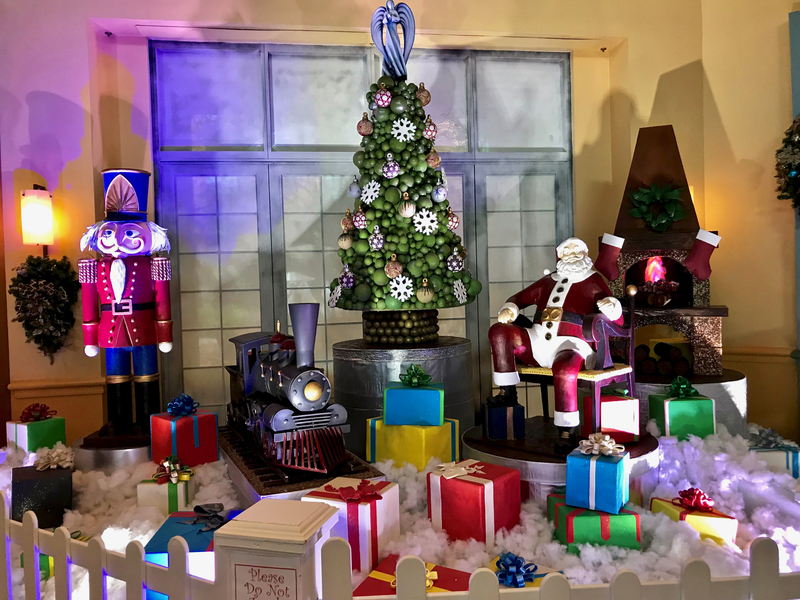 The 5,180,176 calorie Holiday Chocolate Santa Display at the Swan was created by Laurent Branlard, Executive Pastry Chef of the Walt Disney World Swan and Dolphin Resort and the only two-time winner of the World Pastry Team Championship. Photo by Alan S. Dalinka. One Passholder's Tip #38: I Really Have To Say This Edition #2? 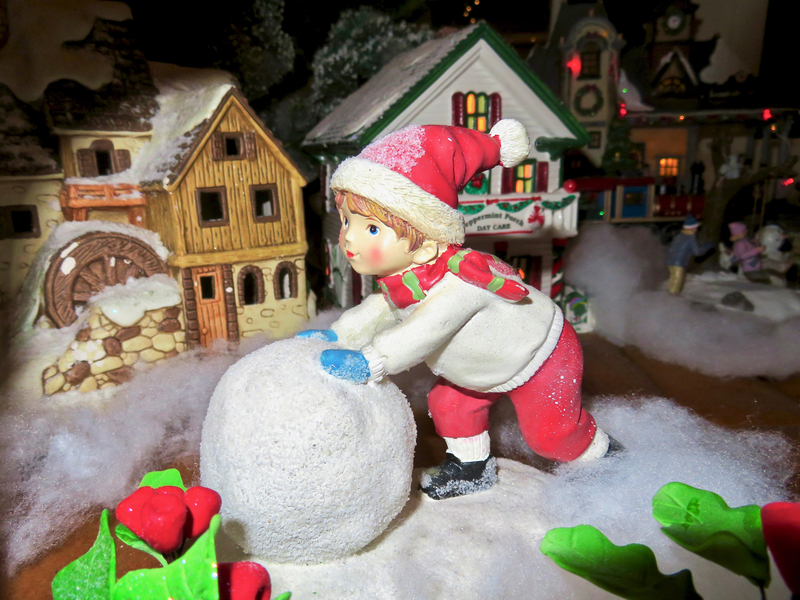 Save money at Walt Disney World: Don’t Throw it Away! 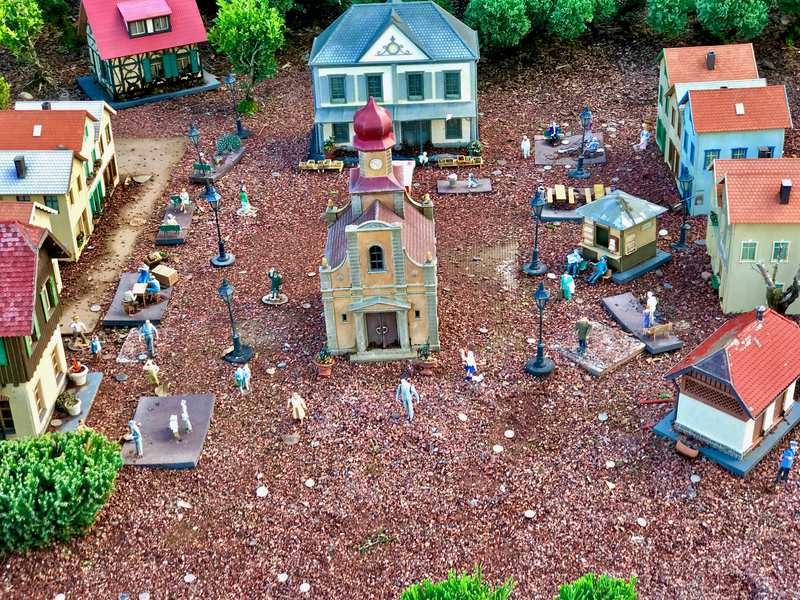 Spare change litters the miniture railroad town next to the Germany pavilion along Epcot's World Showcase Promenade. Photo by Alan S. Dalinka. So often, I hear folks complaining about how much money everything costs at Walt Disney World Resort. Nevertheless, so often, I see fellow guests actually throwing money away. Yes, that is right: we are talking about all those coins folks throw and encourage their kids to throw into scenery and waterways around Walt Disney World. I was privileged to see Pandora–The World of Avatar at Disney's Animal Kingdom during its dedication and media preview ahead of its opening day. Its beautiful streams and ponds looking exactly as the Imagineering team and creators intended. Likewise, inside the queue for Avatar Flight of Passage, the highly detailed laboratory room, full of visual eye candy and "science" experiments linked to the story of the attraction, looking like a place scientists work. On recent visits, I've seen coins in all those places. Indeed, in the lab, I have also seen dollar bills (of several I denominations) thrown into the displays. 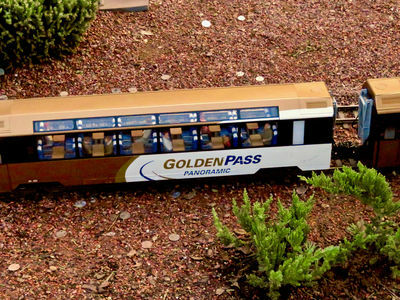 Ruining the look–the purposeful illusion created so that we suspend our disbelief–and, at least to some degree the theming of the environment all for the momentary amusement of the folks that tossed the money into the scene. Coins thrown into the miniture railroad display next to the Germany pavilion detract from the carefully designed scale of the display. Photo by Alan S. Dalinka. So, if you would like to give your money away, no matter your beliefs or religion, there are plenty of charities and organizations that will be happy to have it. Plenty of politicians too, of every stripe imaginable. There is no need for you to add to Disney's carefully designed scenery (except, of course, during events like Epcot International Festival of the Arts where guests last year were invited to paint squares of a mural, for example). While Disney tries to collect and donate the money thrown into the likes of the it's a small world boat ride, there are much more direct places to make those donations: from the Disney Conservation Fund to Make-A-Wish. I truly hope I did not need to say this for the sake you, our readers, but do please spread the word: avoid paying this uninvited extra "fee" at Disney Parks. Be governed accordingly. …With colder weather possible in Central Florida in winter, watch for closings of the water parks. Just yesterday, for example, Disney's Typhoon Lagoon was closed due to the low temperatures. Disney's Blizzard Beach is currently closed for its seasonal refurbishment. Beyond Walt Disney World, be aware that other area water parks also may close on colder days; Universal's new Volcano Bay, for example, has closed during the past week as well. …There is still time to #ShareYourEars on Instagram, Facebook & Twitter! Photos can be uploaded to Facebook, Twitter or Instagram between now and December 25, 2017. 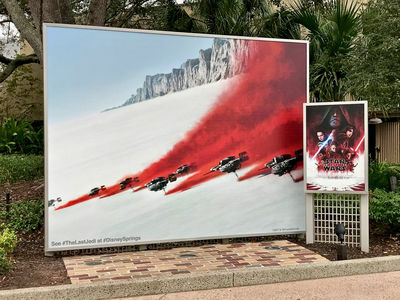 Note that the images must be publicly shared for Disney to count them toward the campaign. …Speaking of Instagram, Magic Kingdom ranked #6 on its "Top 10 Most-Instagrammed Locations" around the globe list. Not surprisingly, Disneyland (in Anaheim, California), ranked #1. Tokyo Disneyland at #5 nudged out Magic Kingdom, and even Disney California Adventure came in at #9, above the other Walt Disney World parks. …The Swan and Dolphin Food & Wine Classic will return in 2018 for its ninth year Friday, October 26, Saturday, October 27, and the Sunday Bubbles Brunch on Sunday, October 28. More details, overnight packages, individual tickets are all now available online, including seminars and beer garden tickets, by visiting SwanDolphinFoodandWineClassic.com. Overnight and multi-night packages can also be booked by phone at (888)828-8850. 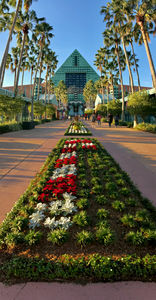 Additional information is available on the Swan & Dolphin Facebook page or by calling (800)227-1500. 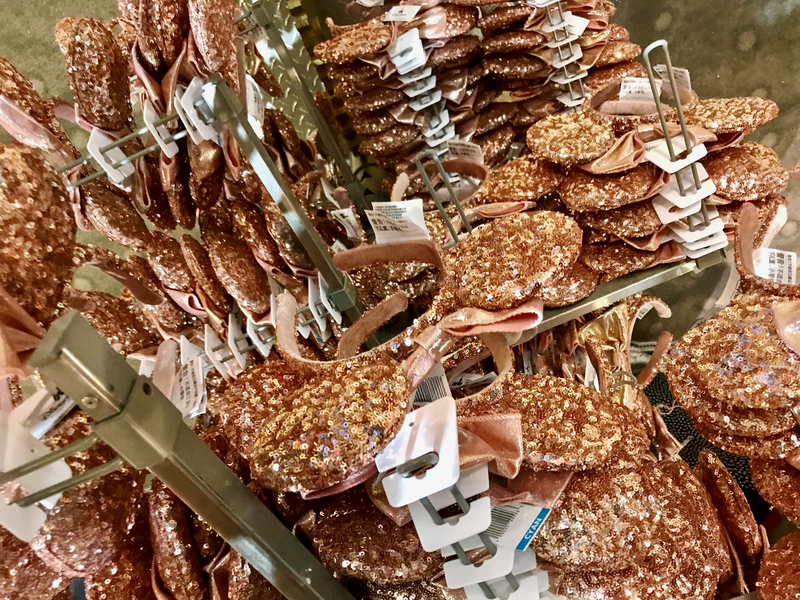 …Around the greater Walt Disney World Resort area this week, Paddlefish Restaurant at Disney Springs is hiding VIP golden tickets with a value of $150 each. The restaurant gave away two last Friday (one each in Kissimmee and Winter Garden, FL), after first teasing their locations on social media with the hashtag #Paddlefishing4VIP. You can follow along and watch for clues on Paddlefish’s social media accounts (@PaddlefishORL) on Twitter, Facebook, and with extra clues at Instagram. Whether or not you find a VIP golden ticket, Paddlefish is also serving up holiday specials: For Christmas (December 25), guests can enjoy Prime Rib Eye with king crab mash, baby carrots and red wine demi-glace for $44; for New Year’s Eve (December 31), Paddlefish will be serving Surf & Turf with filet, cold water lobster tail, crab hollandaise and herb roasted potatoes for $49. Reservations are not required for these specials, but reserations are available at paddlefishrestaurant.com. …While we expect tomorrow to get our long-awaited first-hand look inside Patina Restaurant Group's new concepts at Disney Springs (The Edison, Maria & Enzo's Ristorante, Enzo's Hideaway Tunnel Bar, and Pizza Ponte), we have learned that PRG announced Theo Schoenegger as the Executive Chef of Maria & Enzo's and Enzo's Hideaway. 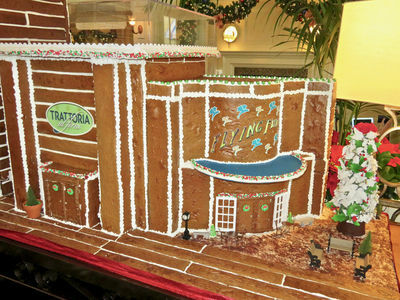 Chef Theo, described by Patina Restaurant Group as "one of the most influential Italian chefs in New York history," comes to Orlando from Las Vegas where he most recently was Executive Chef at Sinatra, an Italian fine dining restaurant located at Wynn Las Vegas (he originally cooked dishes for the legendary singer when living in New York, including spaghetti with clams and ossobuco). Prior to his work in Las Vegas, he spent four years at the helm of Patina Restaurant Group's signature location, Patina, located at the Walt Disney Concert Hall in Los Angeles. 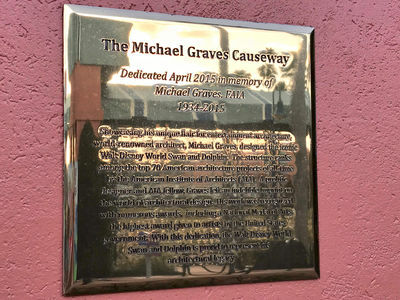 There, he received rave reviews from the Los Angeles Times, received a Michelin star and a Relais & Châteaux rating (one of only two restaurants in Los Angeles have received this honor). A new sign for The Edison faces Village Lake. Photo by Alan S. Dalinka. 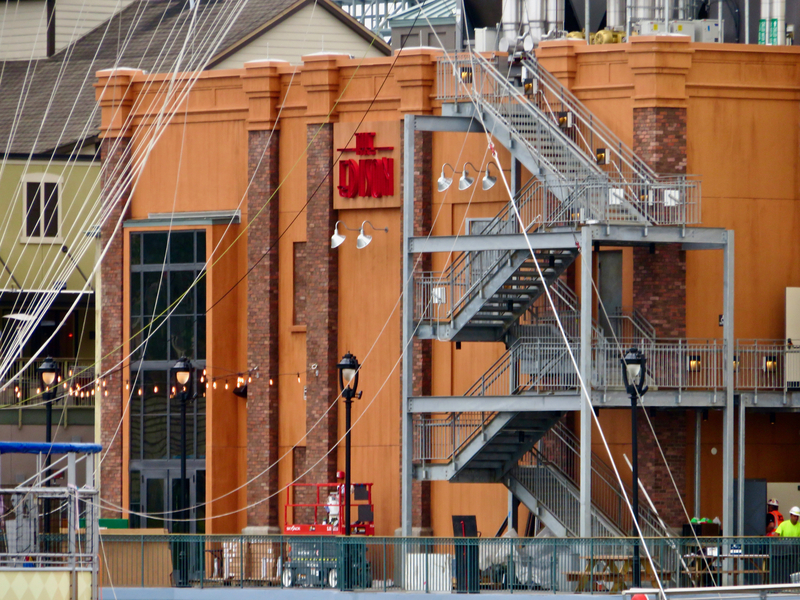 A closer look at the new sign for The Edison facing Village Lake. Photo by Alan S. Dalinka. …Disney Legend Whoopi Goldberg hosts the holiday special, Decorating Disney: Holiday Magic on the Freeform TV network, premiering December 18 at 8 p.m. EST, with special co-hosts Disney Channel's Descendants star and recording artist Sofia Carson and Dancing with the Stars winner and recording artist Jordan Fisher. 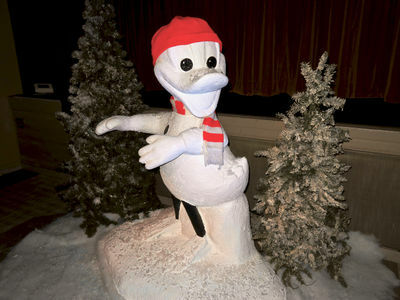 The one hour show features the seasonal transformation of Disneyland and Walt Disney World theme parks for the holidays. 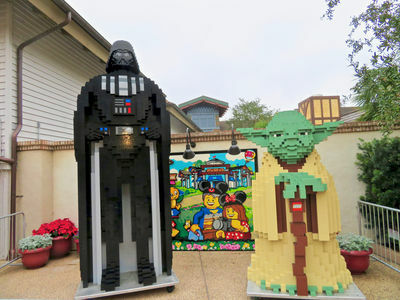 LEGO Darth Vader and LEGO Yoda now stand outside the LEGO Store in the Marketplace neighborhood. Photo by Alan S. Dalinka. 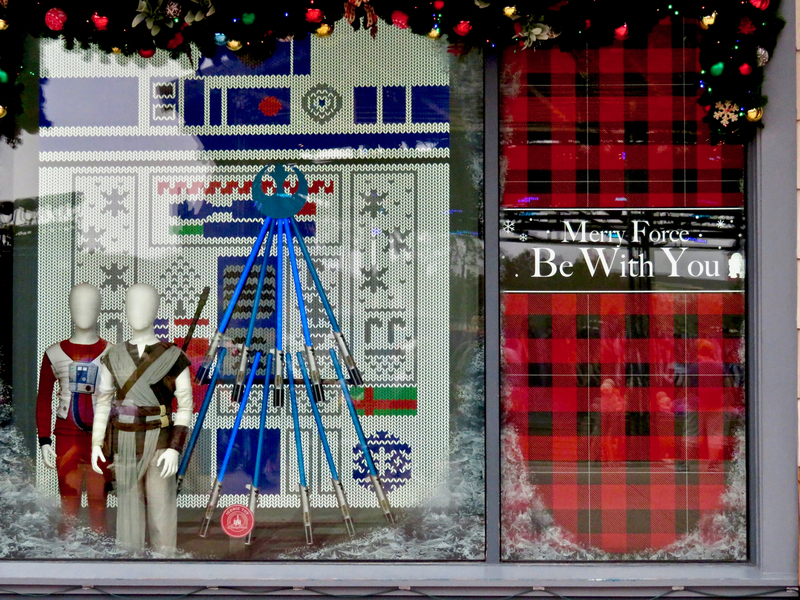 The World of Disney store in Disney Springs offers holiday merchandise for the Light Side fan. Photo by Alan S. Dalinka. The First Order invites you to "come over to the merry side" at the World of Disney store. Photo by Alan S. Dalinka. AMC DINE-IN Disney Springs 24 Theatres begins screenings of the film this Thursday, December 14 (with a special marathon of all 8 Star Wars "Episode" movies starting on Wednesday). 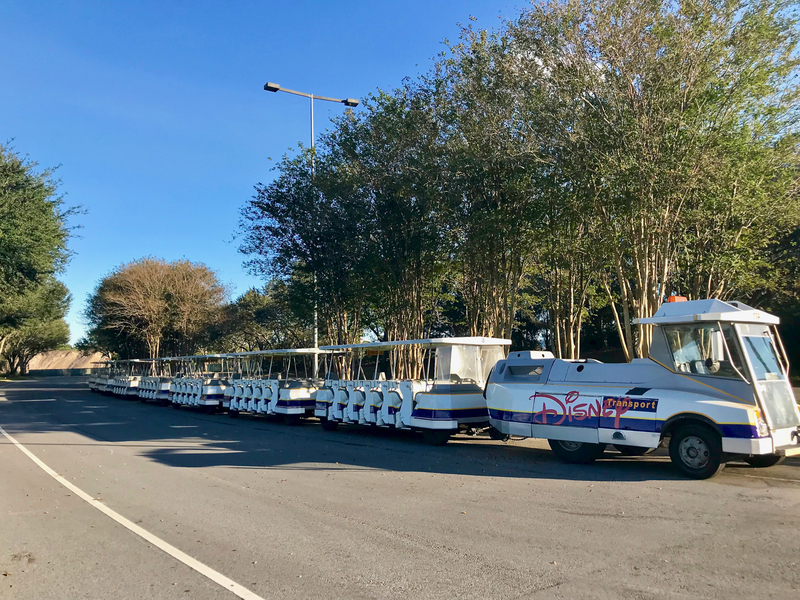 Expect higher-than-usual crowds, and full parking structures at Disney Springs starting Thursday and, probably, continuing all weekend as a result. MousePlanet has been invited to attend a screening of The Last Jedi on Thursday evening and we will report on Disney Springs crowd levels on Social Media in the afternoon. We also promise that our posts will remain spoiler-free. 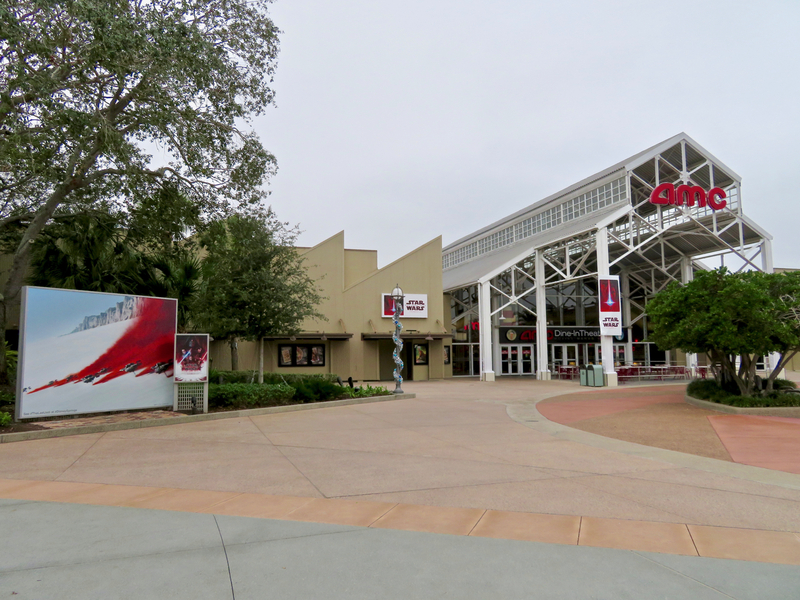 Expect larger crowds around the AMC DINE-IN Disney Springs 24 Theatres both at this entrance and on the West Side starting Thursday. Photo by Alan S. Dalinka. 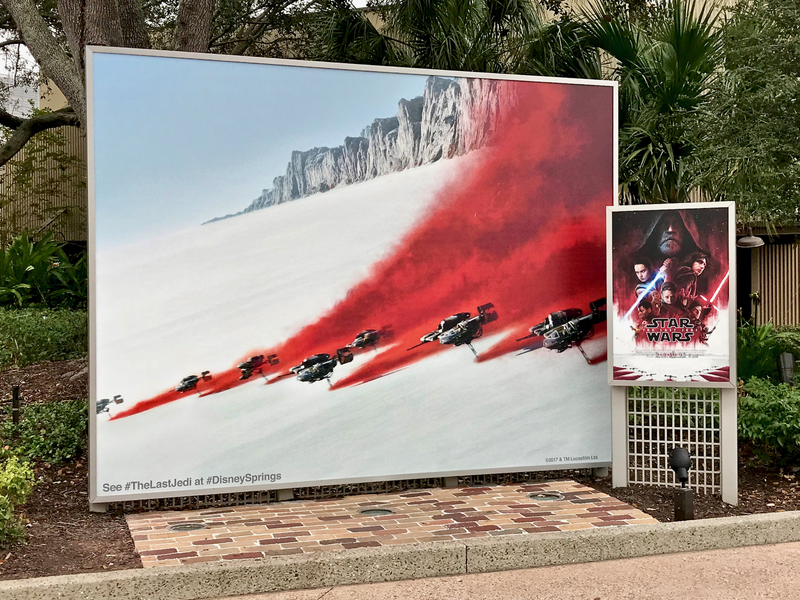 "Star Wars: The Last Jedi" is now the subject of the photo backdrop outside the AMC DINE-IN Disney Springs 24 Theatres. Photo by Alan S. Dalinka. 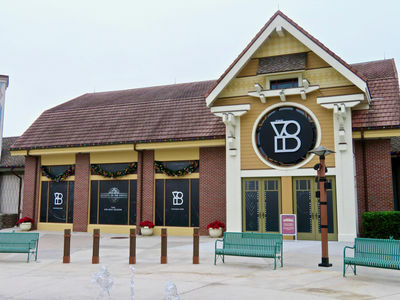 On Saturday, December 16, Star Wars: Secrets of the Empire, a brand new hyper-reality experience from ILMxLAB and The VOID will debut in the Marketplace neighborhood of Disney Springs between the Once Upon a Toy store and the Bibbidi Bobbidi Boutique salon near the Earl of Sandwich restaurant. MousePlanet has been invited to attend a ribbon cutting ceremony at 7 a.m. EST and a walk-through tour ahead of its 9 a.m. opening to the public. (Writer's note: I have personally purchased a ticket to try the experience in the afternoon.) We will provide spoiler-free reports on Social Media in the morning and afternoon and in next week's Update(s). The VOID "experience stage" will open in the former middle section of the Once Upon A Toy store in the Marketplace neighborhood of Disney Springs. Photo by Alan S. Dalinka. 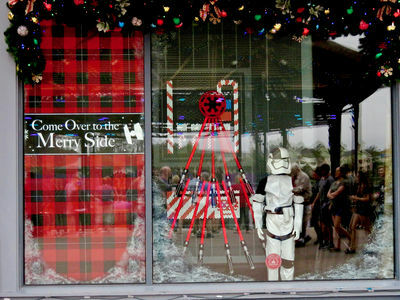 Also on Saturday December 16, Disney's Hollywood Studios presents the second edition of the Star Wars: Galactic Nights after-hours, hard ticket event (meaning, of course, that the park will be cleared of day guests without the special admission tickets; more information and tickets that may be remaining are available at this page of DisneyWorld.com. 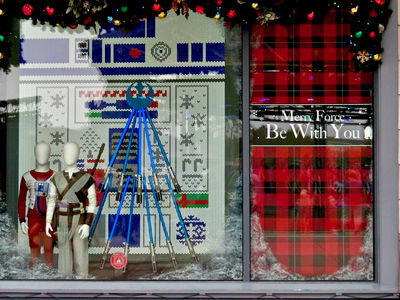 From 7 p.m. until Midnight, celebrating the entire Star Wars saga, the night will be filled with themed entertainment, fireworks, special character experiences, a special "Star Wars: Galactic Destinations" projection show on Sunset Boulevard, special guest appearances from Warwick Davis, and the one-night-only panel discussion about Star Wars: Galaxy's Edge, the new lands under construction and scheduled to open in 2019 at Disney's Hollywood Studios and Disneyland Park, hosted by voice actor David Collins and featuring Scott Trowbridge (Portfolio Creative Executive at Walt Disney Imagineering), Robin Reardon (Executive Creative Producer at Walt Disney Imagineering), Chris Beaty (Executive Creative Director at Walt Disney Imagineering), and Doug Chiang (VP/Creative Director at Lucasfilm). MousePlanet has also been invited to attend this event and will provide reports on Social Media and in next week's Update(s) (and we will attempt to avoid The Last Jedi spoilers, but may post the publicly disclosed details we learn about Galaxy's Edge which, in our experience, all but certainly will not contain spoilers about the attractions and experiences to come). …Post Script: as an alternative to going to a screening of Star Wars: The Last Jedi on Thursday night, the animated short Olaf's Frozen Adventure will join ABC-TV's "25 Days of Christmas" programming on December 14 at 8 p.m. Eastern/7 p.m. Central, and will be followed by the return of the Emmy Award winning holiday special first aired in December 2009, Prep & Landing. The animated short has concluded its limited theatrical release in front of Disney-Pixar's Coco, and includes four new original songs. When searching for the show on a DVR, it may be listed under "The Wonderful World of Disney" title, as it was for your truly. Star Wars: The Last Jedi – Screenings begin at AMC DINE-IN Disney Springs 24 Theatres on December 14, 2017 (expect crowds)! MouseAdventure: Tails (unofficial event) – March 3, 2018 at Disney's Animal Kingdom Park. See mouseadventure.com for more information. –Sunday Bubbles Brunch – October 28, 2018. Members with Resort Reservations: Now open! Moonlight Magic at Disney's Typhoon Lagoon – May 30; June 11, 2018. 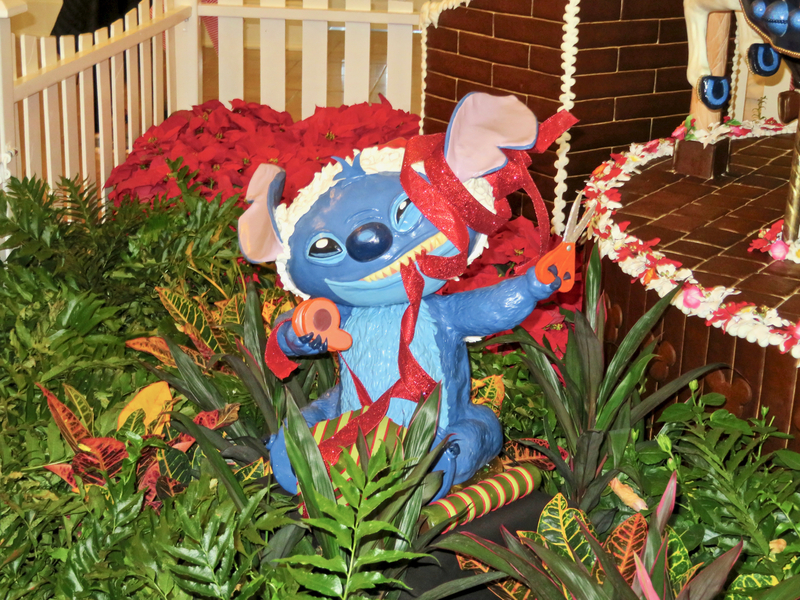 Stitch's Great Escape – closed on a "seasonal" basis - My Disney Experience currently says "an expected re-opening [is] scheduled in late 2017." BE AWARE THAT MANY OF THE 45th ANNIVERSARY OF WALT DISNEY WORLD RESORT DINING DISCOUNTS WILL END ON DECEMBER 23, 2017. OTHER DISCOUNTS AND BENEFITS HAVE EXPIRED OR CHANGED AS OF OCTOBER 1, 2017. 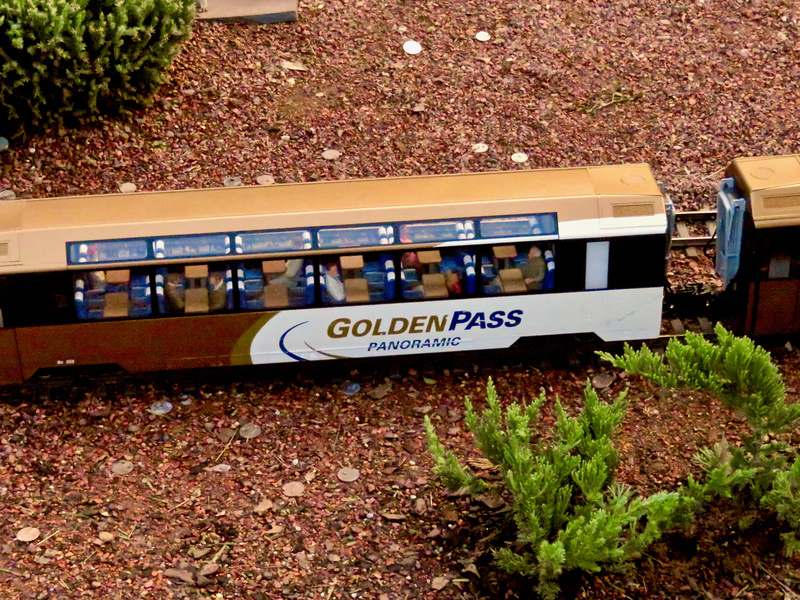 ALSO, BE AWARE THAT THE PASSHOLDER (GOLD) CARD AND PHOTO I.D. MUST BE SHOWN TO RECEIVE A DISCOUNT AND OTHER BENEFITS. Magic Strollers, "a Disney featured stroller provider," is continuing to honor its $5 discount on stroller rental when staying at a Disney Resort Hotel and using coupon code WDWAP17 to arrange your rental. It is once again listed on the Passholder website. Visit the DisneyWorld.com Special Offers page (filtered for Passholders) for information, or call (407) 939-7676 to book by phone. Additional information about available "Passholder Extras" are available here, including discount game tickets to the NFL Pro Bowl at Camping World Stadium in Orlando, an Orlando Magic Jersey Offer for purchasing or renewing an Annual Pass at Amway Center in Orlando, a 15% discount on the Ultimate Nights of Adventure VIP Tour at Disney's Animal Kingdom, Spa & Salon Discounts around Walt Disney World Resort, Amphicar Tour discounts at Disney Springs, runDisney Early Registration discounts, Best Friends Pat Care discounts, Children's Activity Centers discounts, and more (including discounted stays at Aulani, a Disney Resort & Spa in Ko Olina, Hawaii). REMINDER TO MAGICBAND USERS: YOU MUST STILL SHOW YOUR DISNEY VISA CREDIT CARD TO RECEIVE DISCOUNTS AND OTHER PERKS; DISCOUNTS ARE NOT AUTOMATICALLY APPLIED EVEN IF YOU HAVE LINKED YOUR DISNEY VISA CREDIT CARD TO YOUR MAGICBAND. Cardmembers receive 30% off Front & Center, Category 1, 2 and 3 Adult and Child Tickets at performances through December 16, 2017. For tickets call 407-WDW-CIRQ (939-2477) through December 16, 2017. Tickets will be available at Will Call and a Disney Visa Card is required for pick-up. Tickets are also available for purchase at the Box Office or online. 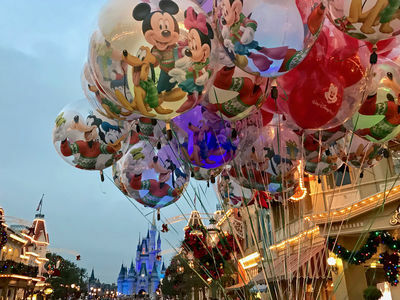 Disney Visa cardholders receive 10 percent off the check when you pay with a Disney's Visa Card and/or Disney Rewards Redemption Card (be sure to request the discount). Offer excludes alcoholic beverages, merchandise, tobacco, room service, holiday buffets, tax and gratuity. Discount does not apply to the following dates: 12/24/17, 12/25/17, 12/31/17, 1/1/18, 2/14/18, 4/1/18, 5/13/18 and 7/4/18, and may not be available at all meal times. Visit this page of disneyrewards.com for the latest list of restaurants and restrictions. 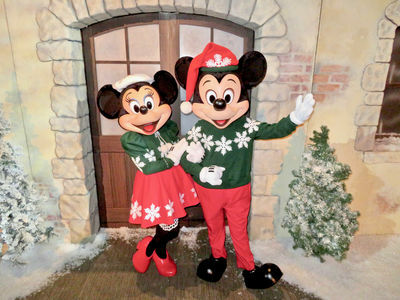 Present your Disney's Premier Visa Card or Disney Rewards Visa Card for access to a private character meet and greet at Epcot for the cardholder and up to five guests. 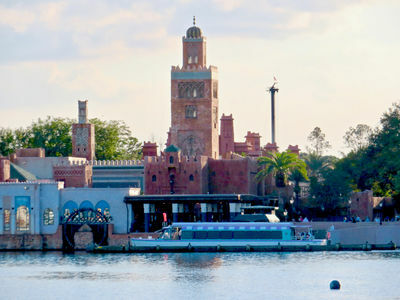 The event is hosted daily from 1:00 to 7:00 p.m. at the Imagination Pavilion at Epcot (enter near the jumping fountains near the exit to the Magic Eye Theater). You'll receive complimentary downloads of your photos (one time per day), which may be accessed in the MyDisneyExperience App (or website). 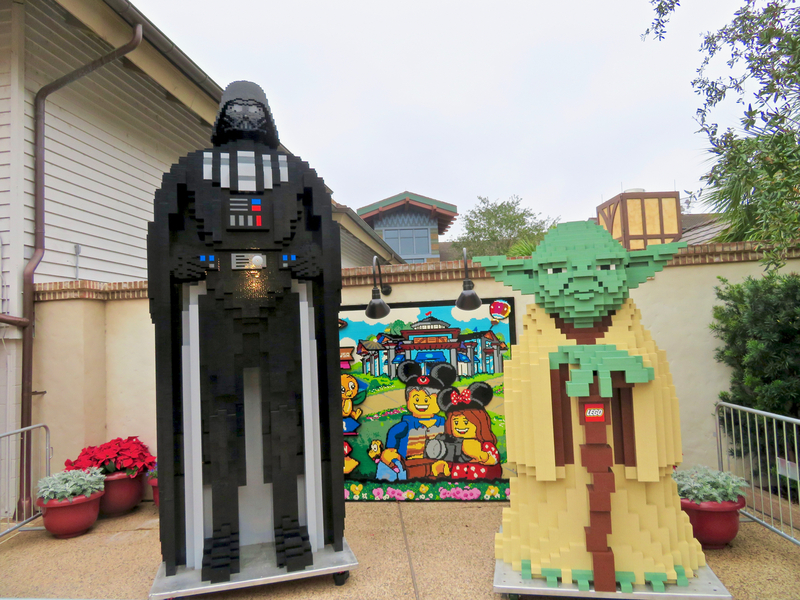 Present your Disney's Premier Visa Card or Disney Rewards Visa Card for access to a private character meet and greet at the Star Wars Launch Bay in the Animation Courtyard at Disney's Hollywood Studios for the cardholder and up to five guests. The event is hosted daily from 11:00 a.m. to 4:00 p.m. You'll receive complimentary downloads of your photos (one time per day), which may be accessed in the MyDisneyExperience App (or website). Active and retired U.S. Military personnel presenting valid ID can save to 25% on tickets to La Nouba through December 16, 2017, for tickets purchased at the theater box office located on the West Side of Disney Springs. Thanks to our reader Dr. Smith who alerted us to the website militarydisneytips.com. Walt Disney World Resort tickets may be used January 1 through December 19, 2017. Disney does not publish the actual discounted rates offered to service members under this program, and instead asks eligible U.S. military personnel to call (407) 939-7830 to check pricing, availability and to make reservations. The website militarydisneytips.com says the offer is 30-40 percent, based on room category. NOTE: Spring Blockout Dates have not yet been announced! Tickets must be used by December 19, 2018. The La Nouba "Florida Resident Family Fun Pack" is back. As its final performance of La Nouba approaches on December, Cirque du Soleil is offering Florida resident ticket deals for its least expensive seats: $96.75 for 3 tickets; $129 for 4 tickets. Offer expires on December 16, 2017, and resident ID is required. Discounts may also be available for premium seat categories. Tickets and information on Cirque Du Soleil's La Nouba webpage. I've never understood why people throw money in various Disney attractions. It's unsightly and such a waste that could go to charities. (Seriously, does anyone know what they are supposed to be?) Photo (and genuine question) by Alan S. Dalinka. I'll miss Flights of Wonder. It wasn't an "every trip" thing for me, but I did enjoy it quite a bit the 3 or 4 times I've seen it. I'll check out the new thing. I hope it will still have some of the impressive flyovers. 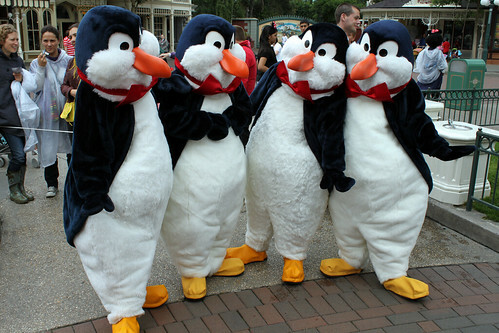 Maybe its because you put birds in my head, but they look like penguins to me. 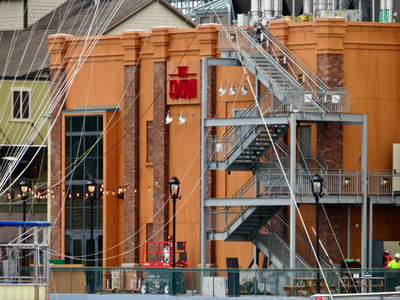 Is this the Disney Springs equivalent of a Rorschach test? Purple outlines on the left and right ones is what my mind tried to fill in for the blanks when guessing owls, but I guess it could also be penguins. The one in the middle almost looks like they tried to make it look like he/she is wearing glasses, made me also link to the "wise old owl" idea. Or I could be totally imagining it! Okay, following my own Tip from a past Update, I�ve put the question about the Disney Springs mystery characters to @WDWToday on Twitter and will watch for a response. Having now seen the Last Jedi, I wish to revise my opinion regarding these being penguins. Though I still maintain that penguins were a high influence in theming and the bow-tie-esq neck piece still reminds me of Mary Poppin's Penguins.